On e Ocean ‑ One System. REGIONAL NAVIGATION 'ONE OCEAN' SOLUTION? Regional organization of "Port State Control"
BSPC Convention on the Protection of the Black Sea Against Pollution, Bucharest 1992. GOOS Global Ocean Observing System. IMO International Maritime Organization, London. IOC Intergovernmental Oceanographic Commission, Paris. NEAPC Convention of the Marine Environment, Programme, Nairobi, Atlantic, 1992. UNEP United Nations Environment Programme, Nairobi.UNCLOS United Nations Convention on the Law of the Sea, 1982. The size of the object is only 0.13 % of the Earth’s ocean. To scientists, the Black Sea is a fascinating "miniature ocean" complete with intermediate layer ventilation and deep water formation while the status of the marine bio­sphere has been little else but deplorable for years. The ecological system is in a crisis while some parts are approaching catastrophic dimensions. Anthrophogenic stress affects the structure and function of sea and oceanic system, but not alone. Nature itself did much to create an unfriendly sphere for marine life. The Black Sea is the largest water basin in the world contaminated with hydrogen sulphide. Thus, 90% of the sea water is anoxic. The marine biosphere living in oxic water stay in the surface layer of 200 meters. Recently the layer has been becoming thinner and thinner. A jellyfish Mnemiopsis largely replaced common fish sources less than a decade ago. The marine plankton blooms, red tides, becomes more and more frequent every year. "Nobody really knows why all this is happening", said a oceanographer recently. "It may be a combination of overfishing, pollution, climate change and shifts in the food chain". A miniature sea with oceanic problems. What qualifies for a model case? No doubt, the Black Sea is a case and requires commitment by all concerned, but it is not alone in this respect. Problems with the marine environment exist around the globe. Everywhere politics, science and the laws have a long way to go to understand and to manage the marine environment. Ocean consciousness is still rare and ocean management has not proved to be effective. Exploring management tools from monitoring to responsibilities and impact assessment to liabilities in a small confined continental sea therefore seems worthwhile. After all, nobody knows how stable the oceans are, how anthropogenically immune they are, or how much time is left until the oceans could run ‘out of order‘, depriving humanbeings of their entitlement to a healthy and productive life in harmony with nature (Principle 1, Rio Declaration). A model case must embrace general objectives, important beyond regional constraints of a sea area. The word ‘model‘ covers a number of meanings, example, sample, pattern, specimen, standard, prototype. In the legal field one would speak of a precedent, a test case or a test action and of a model law. Here it is meant as a special case to serve as a test in marine affairs for the global community. The question is whether the feature of a regional sea provides conditions which could serve as a prototype to tackle many unknown and unsolved ocean problems more quickly, more vigorously and more efficiently. The criteria applied must be convincing to other players facing similar questions. What counts is a picture for comparison and evaluation of facts, circumstances and constraints. The case in question must be of a kind that alternatives are neither fully convincing, much more costly or, solutions may arise too late. Indicating a special case requires gathering differences, tracking issues of importance and discussing their value to be used as a ‘model case‘. The test area to discuss, "offers unique opportunities for observing and testing various mechanisms related to convective and double diffuse processes and interaction of basin scale with the shelf regions". But a model case should go even further to reach wide applicability and interests. The main target is accelerating progress in the field of marine science and the law of the sea. 15 years ago, the Third UN Conference on the Law of the Sea addressed the ocean issue clearly and plainly: states have the obligation to protect and preserve the marine environment. The text derives from Article 192 of the UN Convention on the Law of the Sea (UNCLOS), The obligation to protect and preserve is unconditional. The oceans have been given a status per se. UNCLOS is international law since 1995. Five years ago, more than 100 world leaders attended the international Earth Summit in Rio de Janeiro promising to collaborate on common environmental challenges for the needs of present and future generations.They acknowledged in the Rio Declaration 1992 and Agenda 21 that the marine environment is an essential component of the global life‑support system. They urged for law regarding liability and compensation to be developed and called for marine environment impact assessment, systematic observations and support for data collection and distribution through a "Global Ocean Observing System" and com­mitments in many other ocean related issues as well. In June 1997 when the United Nations convened a review conference ‘Earth Summit Plus Five‘ in New York, most felt there was little to celebrate on major commitments in 1992 as atmospheric warming and deforestation, while the ocean issue received little attention if any, although the situation of the marine environment got worst instead of better. The reason is simple. Until now the oceans are too big to understand their processes well enough to formulate responsibilities and to act accordingly. To protect and preserve the marine environment the oceanic system must be understood. Understanding means the ability to establish in one or the other way, monitoring, observation, or modeling, a comprehensive status of all oceanic waters frequently in such detail that all changes can be evaluated in regard to their cause, natural or anthropogenic, as well as the impact on the global oceans, its biosphere, water movements, the atmosphere, continents or polar regions. Only than the requirements of Article 192 UNCLOS would emerge clearly enough on how to sustain the oceans and to identify anthropogenic forcing. There is nothing in sight to reach that stage in the near future. The Earth Summit 1992 did little to meet the require­ments of Article 192 UNCLOS or vigorously attempt to reach the knowledge required. Based on this background, objectives to accelerate progress are chosen and the intended presentation and discussion are given. Testing computer models or how many real data are required. Steps 1 & 2 are iterative. Better models lead to improved moni­toring systems). 3. Prediction (modeling), (requires explicit assumptions about externalities). (may be designed to reduce the predicted environmental impacts or to protect society from these impacts). Firstly: what is required is a reliable image of the ocean form the surface to the sea floor at a frequency and over time periods detailed enough to trace changes back to the cause, natural or anthropogenic. The principle aim is to establish a true ocean image or description. The question is, how many data have to drop in every day (week or month) until computers are capable to draw an image of the oceans at any time, e.g. comparable to the present state of art in meteorology. Secondly: It is necessary to prove that computer models can produce reliable predictions and to what extent and over which time period. Thirdly Ocean modeling would have to take into account atmospheric conditions, thus extending the objective to coupled ocean‑atmospheric modeling. Assessment ‑ Compensation: A Search for Standards. The subject of concern are the waters of the oceans and the responsibility of States. But there is limited willingness to apply latter and even to define in detail rules necessary. One is tempted to ask, whether it is possible to imagine a legal order without sanctions, or even without the first step towards sanctions. The present standards and rules in this field which are discussed later are hardly sufficient to meet the requirements of Art. 192 UNCLOS. It is a huge field for consideration, as it covers practical and legal questions, quite often depending on each other. The community of states seems to be reluctant to address this subject more forcefully and this may have its reasons more in a lack of information than by intention. The fields requiring attention are ocean dynamics, marine biota and sea‑bed sediments. The paper focuses particularly the ocean dynamic issue. observing system (Model I) to develop rules and standards on anthropogenic impact assessment and if deemed necessary to define monetary redress. This will be the second field to discuss the usefulness of the Black Sea as field for developing management and legal tools by giving an overview of the present situation which may force on its own to show the need for a model case. A few years ago the Black Sea countries met in Bucharest to consider steps to save the sea they share. While conscious of the importance of economic, social and health values of the marine environment and convinced that the natural resources and amenities can be preserved primarily through joint regional efforts, they drafted rules according to principles, customs and rules of general international law for regulating the protection and preservation of the marine environment. The commitment and aim was fully in line with previous regional efforts in coastal sea management. The object is to achieve progress. But as everywhere the subject of concern, the sea, was given attention only insofar as national sovereignty was not affected. Although the water body of the Black Sea is neither possessible nor can it be held in anyone‘s power, the parties agreed on the task "on the basis of full equality in rights and duties, respect for national sovereignty and independence, non‑interference in their internal affairs, mutual benefit and other relevant principles and norms of international law". That is the way it is done everywhere. States are used to land territories. But the oceans are different. Sovereign rights, individual legislation, jurisdiction and management run contrary to the 'rules of the oceans'. More attention to them is the way to progress in marine environmental affairs. The Black Sea may need it soon and thus could initiate a new ocean management approach. In this respect navigation could play an important part and form the core of a ‘test‑side‘for a joint or new ocean management. The legal text comprises all principles included in other regional treaties but less programmatic, than, for example, the treaties regarding the Baltic Sea or North Sea. Although the preamble to the convention emphasizes the Black Sea‘s 'special hydrological and ecological characteristics and the hypersensitivity of its flora and fauna to changes in the temperature and composition of the sea water‘ the legal text pays little attention to "characteristic regional features", as urged by Art. 197 UNCLOS. As the Bucharest Convention did not contain specific objectives, obligations or time‑frames the member states adopted on a meeting in Odessa on 7 April 1993 the Ministerial Declaration on the Protection of the Black Sea (Odessa Declaration) to supplement the Convention with objectives and priorities. The document states: "the pollution of the Black Sea poses serious threats to the coastal states and is a source of concern to their peoples and the international community as a whole". by the Intergovernmental Oceanographic Commission (IOC) establishing an IOC Regional Black Sea Committee as the management body for the IOC Black Sea Regional Programme (IOC‑Report/95). It urges the Black Sea coastal states to commit themselves to ensuring that the future Black Sea basin‑ wide operational oceanography is conducted to the maximum benefit of the region. International transportation from the North Sea and the Baltic can reach the Black Sea via inland waterways Rhine/Main/ Danube or St.Petersburg/Volga/Don/ Avon Sea and by ocean shipping from the Mediterranean Sea. Traffic will increase considerably. Only recently, a $2 billion pipeline contract from the Caspian Sea to the Russian port of Novorossisk on the Black Sea was signed. The pipeline will go into operation in 1999 and will initially carry 70,000 tons oil per day, and later 200.000 tons p.d.. To avoid the transportation of this oil through the Turkish Straits, a pipeline is planned from Bulgaria to Greek. The reason is political. Transportation is not to be hampered by unilateral national legislation on shipping in the Straits. Navigating and access to the Black Sea has been a principle maritime topic ever since. Thus the economic/political background of the Black Sea region can hardly be ignored. More than anywhere else enclosed seas require mutual attention by all ripuarian countries. Shipping, fishing and tourism are essential for regional development. The population density along the Black Sea coasts is high as is the degree of industrialization. Nevertheless, since the East‑Bloc economic system crumbled a decade ago the regional economy of the Black Sea countries Russia, Georgia, Turkey, Bulgaria, Rumania and Ukraine have required restructuring of trade and communication as well as adaptation to global competition. A healthy regional economy and a healthy state of the marine environment are mutual preconditions. To this end Art. 123 UNCLOS urges these states to co‑operate as it derives from the principle concept of UNCLOS that the protection and preservation of the marine environment will contribute to the realization of a just and equitable international economic order. And in this respect, Black Sea problems and communication on mutual understanding are particularly demanding. It might be necessary to do more than international standards demand. Ocean water masses do not recognize legal boundaries, at most, physical ones. The same applies to the most remote ocean of the global ocean system only connected by the natural, narrow and shallow waters of the Dardanelles, Marmara Sea and Bosporus with the Mediterranean Sea, called either the Turkish Straits, or the Black Sea Straits. merchant ships using the Strait. The legal regime is now governed by the Montreux Convention of 1936. Although the UN Law of the Sea Convention (UNCLOS) provides a detailed legal framework for international straits, the Turkish Straits is, as a 'long‑standing international convention' applies, not covered by UNCLOS. For this reason the Montreux Convention is widely separated from the main stream of legal developments and the UNCLOS system on solving international disputes. In the legal field of international straits' navigation non is as 'solitary' as the Turkish Straits. through the Straits spurred the countries concerned into actions when Turkey promulgated new "Maritime Traffic Regulations for the Turkish Straits and the Marmara Region" and proposed traffic separations schemes to the International Maritime Organiza tion (IMO). Some solutions have been found, but the legal debate on the Straits regime is likely to continue. The Turkish Straits are excluded from the Bucharest Convention (BSPC) south of the line Capes Kelagra and Daylan but includes the area north of the line, thereby also the territorial sea (TS) and the exclusive economic zone (EEZ). The Montreaux Convention and the BSPC are fully separate legal subjects (Art.24 BSPC). This is confirmed in Art.3 BSPC whereby all conventional provisions are based on the "respect for national sovereignty and independence, non‑interference in internal affairs", but Art. 3 states also, that "The Contracting Parties take part in this Convention on the basis of mutual benefit" and are required to protect the Black Sea from pollution by vessels or dumping and to cooperate in combating pollution. Navigating in, to and from the Black Sea, the state of the sea and marine pollution prevention are closely linked in this sea of just the size of 0.13 % of navigatable ocean. This circumstance could serve as a model case on the ground that the marine environment requires ‘new thinking‘. One Ocean ‑ One System. Model I & Model II alone would actually force one to consider also whether the Black Sea could serve as a case with a model character for a new stage of cooperation, or for developing more efficient ocean management concepts and frameworks for the application and enforcement of laws based on a 'one ocean ‑ one system' approach. On one hand it would greatly increase the results and make use of them from the model objectives on ocean observing and assessment/compensation, on the other hand it would make the whole model concept much more convincing, either in the case the Black Sea riparian countries wish to find support or vice versa third parties consider it worth to participate in one or the other way while the expected results could be useful to them. A number of subject can be addressed in this respect, the most important is related to navigating to, in, and from the Black Sea. Although the Black Sea is drifting to the edge of collapse through land‑based pollution ( 90% and more), the 'hottest' political issue is shipping. With regard to protection of the marine environment, the contrast could hardly be greater. While the latter is covered by a close international legal framework on control, liability and compensation, the former ‘goes free‘. Not only the dimensions seem to be out of any proportion, but they are of little help for the Black Sea situation and the region itself. However, a new stage of cooperation is likely to touch sovereignty issues in one way or another thus is a extreme sensitive issue. Accordingly, one could argue right away that there are more enclosed seas to take the lead on this ground. On the other hand, a ‘one ocean ‑ one system‘ approach could seek for solutions in a rather old contentious political matter between Turkey and its neighbor around the Black Sea on navigation to and from the Black Sea through the Bosporos. After all, this paper only attempts to discuss the usefulness of using a model case for accelerating progress in marine science, ocean management and legal rules and standards and the place which could fit such undertaking. The Black Sea used to be a saltless water pool 9,000 years ago the basin was well ventilated from top to bottom. Four large rivers Danube, Don, Dnieper and Dniester and well over 50 smaller rivers have supplied the basin with fresh water, 350 km3/year. A little less (225‑300 km3) is additionally contributed annually by rainfall. Together it represents just 0.1% of the total water volume of the Black Sea. The basin’s land‑locked situation changed about 8000 years ago. High saline Mediterranean water (36‰) spilled through the Bosporos into the basin ever since. The inflow occurs at the sea‑ bed of the 50 Meters depth Bosporos at a rate of about 310 km3 /year, while less saline water from the Black Sea surface water layer (18‰) travels as surface current via the Bosporus to the Mediterranean at a rate of 350 km3. Further 350 km3 from the Black Sea surface water evaporates annually. But the balance of fresh‑water inflow is positive. A rough calculation shows that a time period of more than 2000 years would need to pass for returning the basin to a fresh‑water lake from the moment any water supply from the Mediterranean had ceased. The physical structure of the water‑body changed with the inflow of saltwater dramatically. Generally speaking, the basin comprises two water parts on a ration 1:10, a thin oxic surface layer and the anoxic deeper water. The two parts are very distinct from each other, the properties of the surface layer is the reason. Due to the high density of the inflowing salt water it is forced to the basins depth. Over the thousands of years it mixed with existing water but increased its share in the total water volume to over 90% today with an astonishing consistent profile in temperature of 8.9°C and in salinity of 22,3‰ below the surface layer to the basins depth of 2200 Meters. It is assumed that the resi dence time of this water is in the range of 400 years while at the very bottom it could be up to 2000 years. This status is unique to any other ocean basin. The reason is that the deep waters is without a frequent vertical circulation. Comparable deep seas like the Mediterranean Sea and the Red Sea are much different in this respect. Through strong evaporation the surface water reach a high degree of salinity. The water gets ‘heavy‘. The water becomes even more dense by cooling in winter. Each of the two forces a deep convection by turning the water masses ‘upside down‘. The circulation reaches the deep basins. This is prevented by the lighter, less saline water covering the surface in the Black Sea. It functions like a blanket separating the deep waters from atmospheric seasonal changes. The top layer of the deep water is thus 'protected' from cooling in winter, getting heavier and sinking. Actually, the ‘blanket‘ has more characteristic zones, the permanent halocline ( in 50‑200 m depth) which separates the surface water from the deep water, covered by water identified by a minimum temperature, called the cold intermediate layer (CIL) and the mixed salt/fresh water surface layer with a salinity of 17.5 to 18.5 ‰. Due to rain and river inflow the salinity is at its lowest at the top, while the temperature varies seasonally, near the margin and shelf areas as deep as 100m but in the central basin only to a depth of 50m. In other words, the salinity and water density increases rapidly toward the deeper parts of the surface layer, while temperature decreases to a minimum in the CIL of slightly less than 7°C at 100m in the margin and 50m in the central basin.Based on the physical water structure by salt content and temperature, the special feature is oxic and anoxic. The Black Sea is the largest water basin in the world contaminated with hydrogen sulphide (anoxic). In the centers of cyclonic gyres (meanders) the hydrogen sulphide narrows the distance to the sea surface by 100 m or less, at their peripheries the surface layer remains unaffected to a depth of 150 m. This zone, called the co‑existence zone (C‑layer), is located where oxidation of hydrogen sulphide occurs. In the layer above dissolved oxygen is present due to water circulation, diffusion and mixing. As a rule, oxygen present in normal quantities decreases monotonoically from a depth of 20‑40 m to 140‑150 m. The sharp boundary determines the marine biosphere. Except for bacteria, life is absent below the CIL. The convective and/or isopycnal mixing processes above the hydrogen sulfide deep water is of crucial importance for the ecology of the basin. continue into lower levels but the intensity decreases exponentially ,. While the anoxic part of the basin is thought to be a quasi‑steady state system the circulation is oceanic. For oceanographers the Black Sea is a most suitable basin where the usual theory of global ocean circulation can be applied. Together with the Baltic Sea, the Black Sea is the most central large water area of the European continent of almost the same size. Both influence the flow of the atmospheric jet‑stream according to their seasonal warming and cooling. Both have less saline water than the world oceans and connected seas with very different consequences. An inflow from the North Sea provides oxygen to the Southern Baltic. In particular, the Baltic currents system is not of the type of the open seas. The Baltic has an average depth of 55 m, only 27% of the Black Sea Area has a depth of less than 200 m. The shallow part of the Black Sea is the North­west, north of the Crimea ‑ Bulgaria line. This shelf water, less saline than in other areas, cools quickly and significantly contributes to surface water ventilation and the forming of the cold intermediate layer (CIL) of the basin. Unlike the Baltic, a huge heat reservoir with 9°C is in place in the Black Sea. Actually, the Black Sea is a ‘cold sea‘. The homogenous water of the Medi­terranean Sea with an average depth of 1536 m has a temperature of 12.8°C andnot less than 11.5°C at its deepest in the western basin of 3719 m and 5500m in the Ionian Sea south of the Greek mainland. The almost uniform salinity of the water ensures a 'top to bottom' exchange throughout the water volume five times the size of the Black Sea. The more the surface water is cooled the more vertical mixing or convection occurs, forcing heat flux to the air. In terms of climatology the relative cold and quasi‑steady state of 90 % of the Black Sea water links the remaining thin surface layer of not more than 50‑100m (CIL) more to the Baltic than to the Mediterranean. The heat capacity for the winter season is limited in principle to mere 50‑100 m surface water. The Red Sea is deep and of a volume close to the Black Sea. In oceanic terms the Red Sea is of a Mediterranean type but much warmer and saline and without permanent river discharge. Due to the shape 2000 km long and 300km wide, the basin circulation is greatly restricted to the rate of evaporation. The Arab (Persian) Gulf, the Caspian Sea and the North Sea have little to offer by comparison. They are neither oceanic in feature nor depth. The biggest difference to any of the above‑mentioned seas provide the open oceans themselves. While the physical principles on which they work can be described in general terms, the details and their immediate and long term interaction in the global natural system cannot. It will take decades to obtain 'true pictures' of them, meanwhile a test site in an enclosed sea should be an option. The Mediterranean as an oceanic basin cannot com­pete as a candidate for practical and financial reasons. The practical reason is due to the lack of a vertical temperature structure as the ocean basins have, from sun‑warmed surface water with temperatures up to more than 20°C and down to 0‑4°C in the deep oceans. The Black Sea has it in mini­ature form in its surface layer. Here a number of ocean phenomena could be investigated well including vertical ventilation and sea‑air inter­action on a seasonal basis. Possibly more important is the financial side. The deep ventilation in the Mediterranean would possibly require a system many thousand times the size and corresponding investment and test‑site time than the Black Sea. The "quasi‑steady state system" of the deep water body would work like a magnifying glass. After all, the Black Sea offers unique "laboratory" conditions for investigating a series of oceanographic and climatic phenomena. The continentality of the basin places particular constraints on the water body by pollution from land and through the air. The drainage area of the basin is stretched far to the North, Moscow, Warsaw and the Black Forest in Central Europe. The total drainage area is populated by 162 million people and of the large marine water bodies one of the most affected by land‑based pollution. As everywhere, the input of macronu trients, phosphor and nitrate has increased considerably during the last decades, but the stress to the basin is in many respect more significant than everywhere else. The sea is not connected to the ocean system, which 'cleans' the water frequently. on the basin‘s water and vice versa the Black Sea provides an excellent field for studies due to its continentality. It is the most inland ocean providing meteorological specifics. The Southern part is subtropical, the Northern part boreal. The sea surface water temperature has an average seasonal range from 4°C to 24°C, one of the highest in any sea area. In the North Atlantic the average seasonal variations hardly exceed 5°C. Mediterranean cyclones have become rarer recently but not in November, December, and February. Only the thin surface layer is basically the immediate seasonal actor although little is known about the extent to which the deeper waters may contribute to sea surface/air heat exchange. While this question might be of less importance as long as the basins water structure remains stable, it is not, once the water system is changing. The complex state of the living resources and recent changes is a subject far too big for this paper. But as a core issue of concern some few notes shall be made. It seems that the Black Sea was less a fishing reserve than one could have expected. In the almost 20 times smaller and only 8.5m (max.14m) deep Azov Sea the fish catch exceeded the total landings from the Black Sea well after World War II. In the 1930s the best Azov Sea catch year amounted to over 304,000 tons and over the period from 1930‑1990 to an average of 171,000 tons/p.a. but have shrunk to yields of a mere 8‑35.000 tons recently. In 1988 Menemiopsis began invading the Azov Sea. In the Black Sea the annual catch was just above 100,000 tons between1940 and 1960 but increased to 650,000 tons/p.a. around 1990. But the picture is not uniform, e.g. Bulgarian catch decreased from more than 19,000 tons in 1981 to 2,000 tons in 1990. With the outbreak of Mne­miopsis the traditional harvest of Black Sea species dropped to a small frac­tion. The distinct harvest differences before the 1980's raises the question on the role of the anoxic water mass or, to address it in more in a legal sense: what status of environment is to be protected and preserved and what is the basis to assess changes and damage. While fishing has increased strongly everywhere since the 1950s the small Black Sea catches compared to the Azov Sea are somewhat surprising even if dolphins took a share until recently. The catch in the Baltic was up to 1 million tons in the 1970s. The fishing industry in Russia and other former East‑Bloc countries was known for their efficiency. Brackish water can easily sustain a high fish population, but fish do not always adapt easily to changes in salinity. According to Volovik et al., long term observations in the Sea of Azov indicate that the salinity plays a big part in the Azov Sea fish population. While the fish is gone the biomass of the invaders have been estimated as being as high as one billion tons for the Black Sea and several tens of million tons in the Sea of Azov. One of the most interesting questions relates to the meaning of the common notion that the basin is a 'quasi‑steady state system‘, or to reduce the question to a single issue: how thick was the oxic sea surface previously, e.g. 500, 100 & 50 years ago, did it thin gradually, did it vary periodically, did the deep water body ever reach the surface since Medi­terranean water poured into the basin about 8000 years ago or, finally, could that happen in the not too distant future? Recent observations indicate that surface water salinity has increased in the NW self region and water transparency decreased during thelast decades. Still under dis­cussion is whether the total basin‘s upper layer of 200 m has changed in regard to salinity and temperature recently. Affecting the basin are unpredictable. But raising a brief scenario may round up the basin feature a little more. To start with, the question previously raised whether the anoxic hydrogen sulphide deep water ever reached the surface. It is unlikely that this has ever happened. It should be known. Hydrogen sulphide stinks like rotten eggs. Once the saltier deep water mass comes to the sea surface, vertical deep convection could start due to cooling of the top layer. The Black Sea could turn into a ventilated basin as the Mediterranean and as other seas are. But this is theoretical speculation, at least as long the positive fresh‑water balance is maintained. Less speculative is the occurrence of earthquakes with seismically generated tsunamis waves crossing the Black Sea. Four tsunamis with heights of less than 0.53 m have been recorded this century, but historical events reached heights of 4m. Unfortunately, little if anything is known of the seismical affect on the sea surface layer or, vice versa, on the deep water body. It might be very significant, at least temporarily. The deformation of the bottom topography in the September 1927 earthquake near Yalta was documented, the emergence of a large break in the sea floor, the sliding of silt down of the Crimean underwater mountains. The Black Sea is special on its own account but in addition its continentality makes it particularly sensitive to man‑introduced processes. In terms of sustained marine environment it is the first large water body which could 'collapse', whereby collapse is defined as irreparable or irreversible. While the present catastrophic state of the marine biosphere is anthropogenic, it cannot be ignored that the basin's natural composition contains a sort of environmental stress uncommon in other oceanic basin. In this respect it is unique. That might raise the thought for not considering the Black Sea as a model case as too 'exotic'. One can emphasize that there is a great need for socioeconomic indicators for unwelcome alterations to the marine environment, the particularly poor state of the Black Sea or its ideal size and unique environment for carrying out synoptic investigations on oceanographic phenomena that are common to different areas of the world oceans. The pros and contras could fill many pages. The Black Sea would end up as the most suitable "miniature ocean". Legislation is what every one asks for when no one knows what to do. Meanwhile the marine environment is governed by numerous conventions and regulations. But the state of coastal and enclosed seas is deteriorating. It shouldn’t. Law can be the most programmatic and decisive management tool if based on sound knowledge, long term strategy, a comprehensive programme, enough means and disciplined execution. Lack of knowledge is the core deficiency, litigation can not close such gap. The present legal approach concentrates on pollution prevention. The strategy is correct. If any human impact or polluting the sea were stopped, the problem would go away. Unfortunately, the problem is not that simple and this is being realized more and more. This awareness is reflected in the terms "precautionary principle" and "sustainable development" widely referred to in the Rio Declaration 1992 and Agenda 21. The marine environment issue requires acknowledgment of the fact that man will never be able to leave the seas 'to themselves' again, as well as the condition, that the sea is a object of 'its own rules'. Management must be based on the knowledge of these 'rules' and the impact of man‘s inevitable ongoing 'sea activities'. Marine management today lacks not only the means on which to formulate a strategy of 'balanced interest' between the rules of the seas and marine activities, but also the time to wait for establishing the facts on which decisions must be based. The oceans are too big to understand them soon. Based on these preliminaries and the previous chapters the present marine environment management approach by emphasizing the Black Sea situation are briefly introduced below. But it is still less detailed than regional conventions recently redrafted or amended, e.g. the North‑East Atlantic Convention, 1992 (NEAPC) and the Baltic Sea Convention. Like other treaties, the BSPC is conservative in its approach to national sovereignty. The functioning of the established "Commission on the Protection of the Black Sea against Pollution" is bound by unanimous decisions and recommendations. In essence, pollution means the introduction of substance or energy by man which have or may harm/hinder/impair/reduce marine life, human health, marine activities, quality for use of sea water, and human amenities. The BSPC definition corresponds with UNCLOS. The meaning of marine pollution can be limited to two conditions: introduction of something by man and a reciprocating affect in some kind to man. Definitions on 'harmful substances' extend the meaning of pollution on the affect on biological processes. The BSPC follows this approach. Chapter 17 of Agenda 21 provides as a key objective "integrated management and sustainable development". The preamble of NEAPC refers to "sustainable management" describing it as "management of human activities in such a manner that the marine ecosystem will continue to sustain the legitimate uses of the sea and will continue to meet the needs of present and future generations". The "sustainable management" clearly indicates the direction, sustaining the uses of the sea for the need of man. The Odessa Declaration 1993 referce to 'Integrated Coastal Zone Manage­ment' by requiring "to elaborate and implement national coastal zone manage­ment policies, including legislative measures and economic instruments, in order to ensure the sustainable development in the spirit of Agenda 21". Chapter 17 of Agenda 21 states that "a precautionary and anticipatory rather than a reactive approach is necessary to prevent the degradation of the marine environment". Considering the notion of its own it might result in far reaching consequences, as too little is understood of changes and interactions within the ocean system. Actually, the intro­duction of the precautionary principle is part of the concept for "Integrated Management" requiring the adoption of precau­tionary measures, environmental impact assessment, clean production techniques, recycling and other activities. In this respect it is meant as a program but does not necessarily imply a diversion from presently applied principles and strate­gies. However, the recently adopted NEAPC stipulates as preventive measure "even when there is no conclusive evidence of a causal relationship between the inputs and the effects" . BSPC does not have a corresponding provi­sion but requires nations to communicate their findings to the Commission before they com­mence activities which may cause substantial pollution or changes to the marine environment. The polluter‑pays principle has been included in recent treaties, e.g. NEAPC and Baltic Sea Conv.. The BSPC is only programmatic in this respect, obliging the parties to adopt individual rules and regulations on liability for damage in accordance with international law. Until now the principle has had little effect. While few separate or significant cases and incidents are taken up, the bulk of ocean pollution from land and through the air passes without any redress. Neither the legal term pollution can be applied nor the ‘damage‘ to the oceans assessed. Scientific and technical cooperation and monitoring. Complementary or joint scientific and technical research is to establish and exchange relevant scientific data and information . It includes designated competent national authorities responsible for scientific activities and monitoring. Assessment of the quality of the marine environment is a principle requirement but not used uniformly. The BSPC concept includes a number of aims by requiring the development of ways and means "for the assessment of the nature and extent of pollution and the effect" including risk assessment, while, for example, NEAPC concentrates on assessment including the evaluation of measures taken, planned and priorities. Best available technique is a fundamental obligation in modern environment legislation. BSPC in this respect only requires cooperation in the develop­ment, acquisition and introduction of clean and low‑waste technology. Best environment practice is a corresponding strategy, actually depending on a process of balancing, e.g. hazard versus social/economic implication. Here as well, BSPC does not formulate it as a principle to be applied but requires cooperation for finding remedies or less harmful methods. The bodies concerned with the imple­mentation of BSPC are meetings of the Contracting Parties and the Commission. Non‑Black Sea States which accede upon invitation by all Contracting Parties may act in an advisory capacity. Interna tional Organi­zations can be invited to assist in determining measures to be taken. In the 1993 Odessa Declaration the responsible ministers adopted objectives and priorities and agreed on meetings on a triennial basis to review progress and implementation. Decisions to be taken by them, are to be consistent and integrated with the implementation of the BSPC. The legal framework for the Black Sea is consistent with internationally applied concepts and strategies for the protection of the marine environment. That the concept is more general than related treaties with a history of up to three decades need not necessarily be an disadvantage. Actually, if all regional marine environment treaties were applied to the extent required, neither the Black Sea riparian countries nor other coastal states would have to bother about the marine environment. To this extent, the legal framework seems sufficient but unfortunately it is not. As far as it serves as programme it still is far short of a concept to regard the oceans as an object "in their own right" which are to be protected and preserved (Art.192 UNCLOS). If law is to serve as an instrument to enforce an obligation, management skill and reliable facts are required. Only a generation ago, a marine scientist described the oceans as " the great matrix that man can hardly sully and cannot appreciately despoil". Although, this scientist must have been one of the last fellows of his time to regard the seas invulnerable, in a nutshell, the legal concept is from that time as well. Only the effect on man was the concern, the ocean system itself was still taken for granted. While the strategy changes toward more regard to the sea itself, the question is time. How long will it take to understand the ocean system sufficiently, and how much time is left for successful ocean management. Not more laws but laws based on knowledge may achieve what it is they are supposed to achieve. That the Black Sea needs a sufficient observing system is stating the obvious. It is possibly more urgent than everywhere else. A test site would greatly assist but a model case has to embrace more general aims. deep‑water on interchanges between two ocean water bodies. through the Bosporos, weather/climatic forcing, tsunamis and so on. The aim at least is simple. How big or small must an observation system be to provide models with data and to test the quality of oceanographic and atmospheric computer models in comparison to natural processes. Computer versus nature. If models fail to meet the required targets, there is no chance to model other oceans. If modeling partially succeeds, the limits of models or the extent of usefulness can be better understood. If the test proves the value of computer models very high efforts will still be necessary to transfer, improve and apply them in large seas and the open ocean. Based on appeal the Intergovernmental Oceanographic Commission (IOC) went into action on GOOS (see Chapter I). The objectives are: to produce de­scrip­tion and prediction of the state of the world oceans; to encourage national governments to finance, or at least support planning and developing an ocean observing system, and to help governments to identify observational programs, and local and regional models and data products. – Global basin scale products delivered to regional or local modeling groups, to be combined with higher resolution data application. – assemble long term climatic data set which will provide data from description of past states, and time series showing trends and changes. EuroGOOS aims "to run an ocean model with a resolution equivalent to that of an atmospheric weather forecasting model requires a computer a thousand times more powerful." EuroGOOS members recently decided that it is logical for Europe to concentrate resources on the Atlantic (EuroGOOS Global Pilot Project).Although well aware that "huge areas of the internal ocean are 'data‑ free'" and many more real data are required, the trust in modeling is nevertheless immense. A International Workshop on the Black Sea in Varna 1991 indicated a variety of topics to be investigated and monitored, i.e. "to establish definitive phenomenology for salinity, temperature, O2 and H2S structures, transport and dispersal characteristics, as well as suspended sediment distribution". It addressed modeling and the fields the riparian countries are sufficiently equipped to work. It recognizes the Black Sea as one of the ideal basins of the world ocean to study long term variability and climate changes in the sea level, the major elements of the atmospheric forcing, the components of the water balance and the hydrographic characteristics together with the implications on various biochemical processes. At the IOC Black Sea Programme meeting in June 1995 the project was endorsed as initial tasks for 1996‑1997 and after review by the Black Sea Regio­nal Committee adopted by the Executive Council of IOC in 1996 as work program for 1996‑1997. 2. Participants: Bulgaria, Georgia, Romenia, Russian Federation, Turkey, Ukraine. 4. Overall project goal: to improve regional capabilities inoperational oceanography including observational, predictive and services aspects of multidisciplinary application. 5. Specific project objectives: to implement basic elements of operational network for observation, oceanographic data exchange, assimilation, forecasting, and issue of products for marine and ecologicial application; to develop science plan for the Black Sea GOOS programme further development. 6. Background (shortened): In general, the region has considerable expertise and scientific potential to gain benefits from participation in GOOS. Nevertheless, there are some obstacles for the development of operational oceanography, which are connected to the following lack of open sea observations, long‑time series of basic elements, unified methodology and standerized equipment for oceanographic observations, insufficient and in‑effective data exchange between national observational networks. 7. Pilot project activities (shortened) Inventory development of existing national observational networks, data processing and predictive tools, models, and review of their scope and capabilities (..). Restoration of (at least) minimal required open sea real‑time or near real‑time observational system (not less than one vessel for each participating country reporting in the SHIP code). Restoration of BATHY/TESAC observations in the Black Sea. Use of off‑shore platforms for marine observations. 8. Pilot project strategy: Compliance with regional strategy for GOOS development. Use of experience of EuroGOOS, NEARGOOS and other existing oceanographic and environmental programmes. Water is the main driving force of the weather and climate. The atmosphere holds less than one thousands part of the ocean water masses. For each kilogram of water on Earth, only one milligram is stored as soil moisture. 22,000 weather observations and analyses have been made twice a day over the last decades. The by far greatest project to collect data from the oceans, the costly World Ocean Circulation Experiment (WOCE) is to make 23,000 stations over the time period from 1990‑1997, roughly the same number of stations collected prior to 1990. The WOCE provides 8 stations per day over the project period. It would be easy to go on with superlatives, simply because the average depth of the oceans is roughly 3500m containing 98% of all water available on Earth. If one considers it to be necessary to observe the formation and movements of atmospheric moisture around the world for weather forecasting every day 44,000 times, a system which has one thousand times more water may, theoreti­cally, require 44 million pieces of data daily to reach the state of art in meteo­rolo­gy and climate research. Or, if one considers for every 200 square km and at every 500 m of water depth one unit for measurement, a calcula­tion would drive the number of stations as high as 10 million. But it is not only a question of number and distribution of stations but particularly in what fre­quency real data need to be obtained per day, week or month accor­ding to com­plexity or stability of a sea area or at a certain sea level. While the upper level of the sea would need a firmer observing network, in depths of more than 200m the number could be less. On the other hand, ocean observation is not a subject for climate research alone, but a detailed pic­ture of all ocean waters is a necessary tool to detect anthropogenic forcing. But today any given number of data sufficient for modeling or providing a true actu­al description, sufficient enough for longer forecasts is mere speculation. The former may require many hundred millions per week while the latter could prove impossible except for mere indications of possible general trends regardless how much real data is collected and how big the computing capacity employed is. Whatever the number of ‘real data‘ or stations a reliable global ocean observing system is needed. Due to its size, a Black Sea observing system would could be one thousand times smaller. Actually, it should require much less, as more than 90% is in a ‘quasi‑steady state‘ with a water renewal time of about 450 years. Thus the anoxic deep‑water with an almost constant level of temperature (8.9°C) and salinity (22.3‰) works like a huge magnifying glass. Nevertheless, the deep‑water is not free of external forcing ( e.g. inflow via Bosphorus) and may prove more difficult to model than possible to imagine today. The water flows, neither every of it part with the samespeed, nor necessarily in homogenous directions, and a current of one centimeter per second is more than 300 km per year. The deep basin currents is often much faster. On the other hand, the surface layer together with the boundary layer (CIL) may even require more data collecting means and modeling capacity as an open ocean area of the same size. The upper sea‑surface layer of about 100m is the most important for seasonal weather. That is particularly the case with regard to the Black Sea where sea‑surface temperature differences between summer and winter are the greatest of any ocean area. Firstly: Implementation of data into a computer ‘ ocean image‘ according to place and time (data management). Thirdly: Forecasting ocean processes over a long period of time. After all, computer modeling will have to play an important part in understanding the natural common interactions and processes. Computers with many teraflops will provide many interesting oceanic and atmospheric images and will allow intentional forcing by the law of physics. The question is how far it reflects reality and even more, how long it will take to prove a degree of reliability to rectify decisions been based on computed results. Many hundred millions of dollars are spent annually on refining simulation models. To this end, GOOS is designed to improve the increase and flow of data to modeling centers. It may work one day, in 20, 30 or 50 years. Until then there is no proof of whether all the investments have made sense, but in particularly there are many immediate problems to solve and many important decision must be made. Modeling the oceans and climate based on GOOS should be given a chance and forced to prove reliability. It is not witching the scope of this paper to discuss the wide variety of observing means available, satellite, acoustic thermo­metry, anchored and drifting buoys, vehicle and robotic devices, merchant ship sensoring, etc.. Most are designed for specific or multi‑ purposes on a wide range. For example, the commercial Seawatch buoy is equipped to collect: air pressure, air temperature, wind speed and direction, wave parameters, sea currents, vertical temperature and salinity profile, oxygen saturation, nutrient contents, particle or algae concentration and radioactivity, while a global system of 500‑buoys could cost some $ 100 million p.a. But a description of the actual ocean processes and impact on climatic changes requires access to data from the ocean depth in yet unknown number. Temperature and salinity is not only the major force of ocean dynamics and ocean water determine the regional and global weather and climates. Actually, a cheap and reliable device to measure sea‑temperature, salinity and currents at any ocean space or depth frequently and accessible by data transmission or data collection within a reasonable time is not available. A test program in the Black Sea would not only offer the opportunity for comparing available measuring technology but include the development of specific technology necessary and economically feasible for mass employment in the open ocean basin. Due to the status of the deep water and the close distances to harbors the task would be easier to achieve than in larger basins with faster currents and more complex conditions. (1) The task of OU is to organize an 100% correct actual ocean description/image and forecast on a defined small scale up to seven days through observation (real time data) and modeling. The task is confined to a time limit (test period), e.g. 2, 4 or 10 years. The number of observing stations to be employed and placed derives from the task and time limit. A small scale resolution could for example be defined as: a space by 100 m x 100 m in square and 10 m per depth from the sea surface to the CIL ( about 150 m depth) and with a larger scale in the deeper water (e.g. 500 x 500 x 500 m). (2) The task of the CU is to predict oceanographic and atmospheric processes well in advance of a week, at least up to a year or longer. For this purpose they use all available data from OU and other sources. (3) After OU has proved the installation of a 100% correct forecasting system for up to max. seven days the CU should prove within a given number of years, that models are reliable or to what extent. The test could be declared as positive once the CU is capable of providing a correct oceanographic forecasts for two years in principle on the space scale the OU had to work. How difficult and expensive such a test could turn out is impossible to say but it would save billions and time in pursuit of a reliable global observing system. For the first time a baseline for many academic, practical and legal questions would exist, whether for political decisions, ocean management or anthropogenic impact assessment. But foremost a Black Sea test could indicate the parameters required for monitoring the biggest phy­sical system of the global natural commons and interchanges within the global system. Setting up a data providing system in the deep‑water seems foremost a question of measurement technology followed by the number required. If it would depend only for providing resolution of general internal oceanic processes like rotating eddies, currents and fronts (ocean climatology) the number could possibly a few hundred. But as the ‘quasi stable state‘ of the deep‑water is nevertheless subject to external forcing the number of devices required could turn out to several thousands. If two thousand devices are employed, each would have to ‘cover‘ the volume of 240 km3, which is roughly two hundred times larger as the scale suggesed (500x500x500m) as task for OU. This part of the observing system will in particularly have to show that it can not only contour the permanent inflow and spreading of Mediterranean water into the basin and the heating at the sea‑floor detailed enough, but also the processes and changes incurred by earthquakes and tsunamis. It is known that about 80 earthquakes and half a dozen tsunamis within the Crimea‑Black Sea region occurred. OU will be possibly faced with a number of other question as well, such as the volume of the deep‑water. The CIL is certainly a particular challenge in regard to observing technology, density of devices, frequency of data transmission. While the CIL is formed on the NW continental shelf a comprehensive image of the boundary between the ‘flowing‘ overlying water masses over the deep‑water is crucial for oceanographic processes and the first major baseline for ocean‑ atmospheric modeling. From the CIL to the surface the water layer is subject to vertical convection. For this part of the sea the data could come from different observational means when initiating a test programme. But either part, observing or modeling by OU is likely to be realized soon that the goal for providing actual ‘true images‘ and forecasts up to seven day, can not be met. In this case the rapid installation of additional devices is paramount. At least, at this point reliable and cheap instruments (mass production) should be at hand. Alone for the surface layer of about 100m depth the number required could go into thousands. If only four units, one per 25 depth in a sea area of 20x20 km are employed, the Black Sea would have to have 1600 units. This part of the programme, sufficient number of measurement devices, would play a very crucial aspect for corresponding observations in the open oceans. Any investment and effort in this respect would determine subsequent investment in the other 99.9 % of the oceans. For this end the quality of observations and short term modeling by OU should ensure that the required number of devices are brought into service without delay and if deemed necessary the number must be raised to many thousands. After all, the task of the Computer Unit (CU) needs the best possible data input as soon as possible. It should have no reason for excuses in this respect. The type of computer models and their forecasting aims should be defined at the beginning of the test phase, but in the conceptual approach the CU should be free to achieve the goal, forecasting as "far ahead as possible" (EuroGOOS), at least with reasonable results e.g. two years in advance. In addition CU work should show the reliable fields and flaws of modeling the oceans and the extent of usefulness in climatic change research. The Black Sea is the only ocean for running a reasonable comprehensive test‑ site on ocean dynamics and processes. Its feature is oceanic with two unique water bodies for synoptic investigations. By developing the technic and experience of ocean observing in a small‑scale laboratory like environment will not only prevent misinvestments but may significantly reduce the risk of finding out in the future what should and could have been done. To ensure that it does not come too late it is necessary to establish a reliable relationship between ‘real data‘ required for sufficient computer models and whether or to what extent computer can preplay and predict the future processes and implication for man of the natural commons. The Black Sea as a model case can only provide an initial step, while subsequent systems in the open oceans will still remain a magnitude challenge. Establishing a true ocean image and corresponding models within the confines of the Black Sea is likely to be many tens of thousands times easier than in the Atlantic. But significant achievements in a laboratory like environment in this respect would not only enhance new approaches in preventive and precautionary ocean management but form a rich source for scientific and legal work on understanding and managing the marine environment. In particularly in the field of anthropogenic impact on ocean processes a comprehensive search of standards and rules on assessment and compensation could be undertaken. Developments on environmental assessment and compensation was raised by the Rio Declaration 1992. In the marine field it is unlikely to happen soon and sufficiently. A rule finding mission is foremost a matter of collecting, comparing and evaluating facts while any subsequently rule drafting deepens on political directives and mere craftsmanship. Gathering ocean related facts more often than not quickly turns bottomless. The functioning of the seas as well as its natural changing habits on one hand and the oceans reaction to a global industrialized society on the other hand is little understood. Implementing a test‑site on ocean observation and modeling (Model I) would form for the first time a principal baseline on the most important aspects of the oceans, ocean dynamics in a ocean basin. Inve­stigating anthropogenic forcing comprehensively would be given a good chance for advancement in ocean management. The functioning of civil societies rests ultimately on responsibility. Article 192 UNCLOS implies the scope of responsibility of States: pro­tection and preservation of the oceans. Thus a pre‑condition is the assessment of antrophogenic forcing of changes. The laws have to define ocean management reactions once impacts or changes in the marine environment have been established. This includes to stipulate monetary compensation, user charge or taxes and punitive measures. Until now the laws concentrate on damage compensation for economic loss in a narrow band. The approach is conservative in so far as it is based on legal possession, ownership and financial losses. The most advanced international framework in this respect can be found in the field if shipping, particularly in oil and hazardous goods transport. Other sources of impact on the marine environment, e.g. from land‑based sources, are still poorly addressed. In 1972 the UN Stockholm Conference on the Human Environment in a Declaration (Stockholm Declaration) required States not to cause da­@''fbeyond national jurisdiction. The Parties to the 1974 Helsinki (Baltic Sea) Convention enthu­siastically agreed "to undertake, as soon as possible, jointly to develop and accept rules concerning responsibility for damage". It has not happened but the subsequent Baltic Sea Convention from 1992 (Art.25) deleted the phrase " as soon as possible". This case stands not alone. In marine field little to nothing has been achieved. The primary reason is not political in­diffe­rence but the insufficiency of information available due to lack of means to establish facts. The facts on ocean physics and dynamics become ful­ly accessible only by a combination of comprehensive observational means, assessment capability and by thorough interpretation of observa­tional findings. The oceans are by far the least accessible natural system on Earth for developing guiding principles of ‘balance‘ between man and the oceans. Meanwhile the Contracting Parties to BSPC are committed to adopt national rules and regulations on liability for damaged caused to the marine environment of the Black Sea. The problem they face is not a regional but a general one. The international law has little practical guidance to offer. The stalemate in this respect does not only hinder the evolution of rules and shared responsibility for the ocean but neglects the role a uniform law concept can and should play. Marine environmental law has to address all aspects as assessment, responsibility, compensation and liability comprehensively, but has to be correspondingly clear, fair, and just to every one and for every one. The Black Sea as a 'miniature ocean' in which the water body is almost completely on its own, circulating for many years within the confines of the basin, could be used to reverse the stagnant situation illustrated by reference to the Stockholm Declaration requirements a quarter century ago. "Environmental impact assessment" means a national procedure for evaluating the likely impact of a proposed activity on the environment", and "Impact" means any effect caused by a proposed activity on the environment including human health and safety, flora, fauna, soil, air, water, climate, landscape and historical monument or physical structure or the interaction among these factors; it also includes effects on cultural heritage or socio‑economic conditions resulting from alterations to those factors". In more general terms environmental impact assessment can be defined as every alteration of the physical, chemical or biological properties of the environment caused by any form of anthropogenic matter and energy or any other human activities which affect it in a direct or indirect way, investigation includes the comparison between past and present or present and future. While this may work fairly well for land sites and along beaches the situation is very different in ocean waters. Art.15 BSPC requires the signatories, inter alia, to conduct studies with the aim to develop ways and means for the assessment of the nature and extent of pollution and of its effect on the ecological system, to examine and to assess risks and to cooperate. The scope is pollution related as defined by both conventions simultaneously. More detailed target have been set by the Odessa Declaration 1993 on listed substances, a trend monitoring system and provisions on assessment and monitoring. The Declaration states: " To introduce compulsory environmental impact assessment of all projects in the private and public sector according to national criteria, which will be harmonized by 1997 where possible"
The Baltic Sea Convention uses the term in regard to proposed activities with possible transboundary impacts and requires that measurements and calculations of emissions from point sources to water and air and inputs from diffuse sources to water and air carried out in a scientifically appropriate manner in order to assess the state of the marine environment of the Baltic Area and is more specific in regard to pollution to land‑based sources. The NEAPC requires the assessment of the quality of the marine environment in accordance with the Annex IV to the Convention including the effect of measures taken. Monitoring according to the Annex IV of NEAPC means the quality of water, sediments and biota and measurements of or effects from activities or natural and antrophogenic inputs. It particularly addresses the criteria and time‑limits set in regard to land‑based pollution. is often confined to marine living resources. On the whole, marine biota is related to a sea area regardless of the 'turn‑ over'of ocean water. While the former is assessible, their environment (the sea water) has changed. Insofar, impact assessment is reduced to one aspect of the marine environment. The state for marine biota concern is usally the immi­diate concern, but the 'stability' of ocean dynamics is what matters as well. This was recently expressed as follows: "The assessment would need to look ahead at least 25 years in addition to building on past experience and the present status", while elaborating on efforts by international organizations in this field. The topic was "Integrated assessment of available scientific understanding, observations and data for sustainable development and ocean management" to emphasize the increasing debate about the oceans and the role of "scientific assessment". But integrated assessment is reliance on an "ocean image". A model like legal set of rules is not available. National legislation seems rare, the European countries included. But the issue is discussed and has been addressed as a ‘new science‘ (and: frontier science). The main field of debate on marine environmental damage assessment is related to incidents by ships. The IMO Manual on Oil Pollution (1995) advice to arrange for surveillance of the oil slick and, by use of available meteorological and hydrographic data, prediction of its probable movement, and, that damage assessment should in­clude arranging for an up‑to‑date check of the potential danger to birds, wildlife, fisheries and other environmentally sensitive features in the area. Damage in this respect can be used describing the damage to something and the legal consequences for the wrongdoer from such an event. If a law requires to undertake damage assessment it is meant as an undertaking to form a basis for the consideration and the application of the laws, civil, criminal and administrative rules and regulations. While criminal investigations and administrative fines procedures require only proof of the law breaking incident but not necessarily a full picture with regard to the damages incurred, the following discussion on the scope of damage assessment for legal purposes is confined to the civic aspect on compensation or restoration if possible. The basis of damage assessment in cases of incidents. The basis can be either defined and regulated by law or has to be conducted according to the applicable definition of pollution or corresponding activities prohibited, e.g. dumping. As far as could be observed only the U.S.A. have implemented assessment regulations recently, the Natural Resource Damage Assessment Rules (NRDA) as required by the US Oil Pollution Act 1990. The NRDA shall apply to officials in conducting natural resource damage assessment when natural resources and/or services are injured as a result of an incident involving an actual or substantial threat of a discharge of oil. The emphasis lays on restoration but the rules also describes ‘Compensation Formulas‘ based on (1) field methods, (2) laboratory methods, (3) model‑ based methods; and (4) literature‑based methods. For example, if the assigned institution (trustees) can not design a restoration plan (which has priority) it can choose from an extensive menu of procedures (compensation formulas) including computer models. Thus the "value" of loss can be determined which may include amenities, like swimming, boating, hunting, or bird‑watching. It must be established that the injuries in question have resulted form the incident. The administration (trustee) has the right to make a 'presumption' which is presumed to be correct unless the responsible party present evidence adequate to rebut the presumption. Burdening the proof on the shipping industry in a field of immense uncertainties and imbalance (see below) the Rules open the gates to administrative (expert) arbitrariness. The ship insurance industry is anything but happy, assuming that there is a high risk of uncontrollable and excessive compensation claims. Of the established regional marine environmental treaties non has taken up the subject. BSPC provides the ground in so far as it requires the signatories to cooperate in detecting polluted areas and to examine and to assess the risks while other convention require a system of monitoring and inspection to assess compliance with the rules, or, repeated monitoring or to give assistance to other contrasting states in investigating violation by ships of the existing legislation on antipollution. But rules of damage assessment are not given. Thus damage assessment is done on a case by cases basis initiated by the authorized institution or authority or in case of litigation by court assigned experts. The framework/guideline of task for the investigator must be either derived from the applicable definition of pollution or, pollution damage. Example: Civil Liability for Oil Pollution Damage (CLC). Pollution damage is defined in very general terms by CLC as loss or damage caused outside the ship by contamination resulting from escape or discharge of oil from the ship, wherever such escape or discharge may occur including the costs of preventive measures and further loss or damage caused by preventive measures. However, compensation shall be limited to costs of reasonable measures of reinstatement but not loss of profit. Although oil pollution cases are possibly one of the best investigated in regard of their impact on the marine environment the application is not without constraints and que­stion marks. In addition, the definition is in principle restricted to the impact on man, actually resulting to, economic losses, costs of clean‑up mea­sures and remuneration of fisheries inspecting/ monitoring measures. In 1994 the Comité Maritime International (CMI) adopted Guidelines con­cerned with the admissibility and assessment of claims for oil pollution damage. The scope of damage assessment in order to establish liability. From a practical point of view the matter is almost not existing, except in shipping or possibly in some very rare individual cases. The 90% land‑source based marine pollution ‘pass‘ without damage assessment for national or international monetary redress. Now one knows which part of these 90% could be or should be regarded as damage to the marine environment. There is no other way but to accept the situation for the time being. The present law system is not capable of taking allowance of the issue. A recently adopted Convention by European States on activities dangerous to the environment is too narrowly defined to have a significant application on the ocean issue. To apply legal provisions on pollution, the circumstantial facts must meet a number of conditions to provide the means for establishing liability. The evaluation requires reliable description of the incidental circumstances , the reasons, kind and extent of damages, the consequences of incident and particularly factors on which the causality between the incident and the damage could be established. But it is easier said than be done. Ocean water mixes and moves on. Without a test site providing facts a substantial step on identification of reliable short and long term criteria cannot be expected. The whole system not specific kinds of pollution or specific ocean issues is to address. What is necessary are guiding principles on ‘balance‘. Balance is measured by ocean natural commons and activities by man according to impact. Without a fully employed ocean observing test site, which would provide a principle baseline for ocean assessment, the facts required to develop a political strategy on scope and aims of assessment seems remote to achieve. A strate­gy means foremost the ability to distinguish between important and ur­gent from less important or unimportant from the point of the oceans over any space and any time period. In a general sense "damage" should not be defined as a monetary loss to man alone, but any activity which injures 'ocean preservation'. Impact related is any activity whether incident related or 'combined' input inducing chan­ges. In this respect marine environment damage assessment is an impos­sible task. It actually requires full understanding of the oceans with all the varying characteristics of the ocean waters and reactions to ‘in‑puts‘: reali­zable or latent, direct or indirect, long‑term or short term, reversible or irreversible. Reliable categories on ocean ‘vulnerability‘ according to sources may possibly of more efficient than relying an damage assessment alone. Land‑based source pollution will remain difficult to be addressed on an individual case. The present situation is hardly acceptable for long. The shipping industry is almost the only marine pollution source with international liability. he review indicates a wide range to conduct assessment, but with little regard to the specifics of the marine environment. The open oceans or large seas leave little room for comparisons between repeated assessments. The water body is changing permanently. When regional sea conventions require impact assessment they actually mean the impact of land‑based sources, either as an initial preventive measure, or as control of permanent input into the sea by rivers, air or other sources and transmitter. Repeated assessment at the same geogra­phical location, is actually assessment of different waters. If a sea, like the North Sea, is subject to a complete turnover of water within 3‑9 months, the need of impact assessment exist only as long as ‘input‘ continues. In a nut­shell, impact assessment, as used today, is controlling ongoing land‑ based source pollution in a small area of interest (jurisdiction). In lakes and clo­sed seas the water remains within the basin for same time. Only here the mea­ning of impact assessment provides a basis for comparisons between the past, present and future. A convincing practical or a legal framework on marine environment assessment has not developed. There are not even indications in sight which may lead to developments. For this reason the commitment by the Stockholm Declaration 1972, to develop international laws on liability and compensation has hardly any chance to be taken in consideration soon. Defined obligations and responsibility in legally binding terms is a essential means for sound ocean management. Meanwhile the marine environment drifts to an unknown state. Faced with immense problems and almost not existing international legal framework for land and air based source a search for solutions at a test‑site should be made. A least two conditions a concept on marine environmental assessment should fulfill, general applicability and a service to man and the oceans. A strategy has not yet been formulated and is unlikely to happen in the foreseeable future. The oceans are simply too big, the interaction in the oceans and within the global environment too numerous and the system too little observable and in many respects too little under­stood. What is basically necessary are criteria aimed at sustai­ning a reason­able balance between the use of the sea and the oceanic system. Assess­ment in this respect would mean evaluating and categorizing all ‘activi­ties by man‘ and to organize it legally. b) legally required or relevant assessment. the latter (b) is designed for serving a legal concept. b) rules and standards on individual and general source related impact assessment, hereafter called: qualification assessment. b) individual, e.g. industry, power plant, factory, company etc., including any incident and accident ( but without damage assessment as means for redress, e.g. economic loss). Assessment organized in this form, or any other form guided by Article 192 UNCLOS would enable politics to respond with preventive measures or compensatory means ( see Figure: Ocean Assessment) comprehensively. If the global oceans are too complicated to develop a generally accepted concept quickly, it is advisable to look whether a smaller system could serve the purpose. The Black Sea is a option in this respect. Although it is only to a limited extend comparable with other seas it is nevertheless a basin with oceanic dimension. The specific feature of the Black Sea is no hindrance for the development of a strategy, vice versa, its continentality and severe environmental problems may increase the awareness for the need of more reliable solutions. The Black Sea has reached a point of state that it has become difficult to identify the most urgent tasks. The priorities in a test‑site case are different. They shall primarily enhance progress and capabilities in general ocean management, while the test‑site investments and results are beneficiary to the region subsequently, presumably very sustained. As indicated above, one of the tasks is directed at indication and quantification of all sources relevant to the marine environment. As land‑based (including air) is the principle concern, the task is practical in nature. The real work starts with qualification assessment. Based on a improving availability of an 'ocean image‘ (Model I) all sources of 'input' are to be classified on their actual, or potential, or definitely not existing impact on ocean dynamics, whether in the surface layer or deep water, directly or indirectly. The evaluation of antrophogenic 'interference' in the ocean water structure is the principle task. The very importance derives from the condition, that the oceans are the ultimate force on the global and regional climate stability. For this purpose is the identification of direct and indirect sources forcing potentials to the best degree and detail possible a necessary condition for good ocean management. Evaluation of the indirect impact of organic substances would for example include the impact of red tides on the sea water exchange (horizontal and vertical) and local or general current system. Other sources might be easier or even more difficult to identify and classify as relevant on ocean (sea water) dynamics. The aim is to develop criteria and to set up an initial, but best possible, baseline. The steps to be taken according to results or after the test phase has been ended is to decide than and politically. However, the task need not and should not confined to ocean dynamics only, but extended to biota and sediments as well. Biota would be included in the outlined assessment concept anyway. BSPC emphasized the link between the characteristics of biota and sea water temperature and composition. Detailed information on salinity and temperature is what the Model I aims to achieve. The further discussion is related to relevant marine topics with particular atten­tion to the Black Sea conditions. The main problem of the Black Sea is land‑based pollution. The confined waters offers the opportunity to trace pollution longer and more detailed than under open ocean or large seas conditions. This may include 'testing' the term pollution. The evaluation of impact will face a particular challenge due to the two water bodies with the cold intermediate layer (CIL) separating the two waters and the Northwest shelf area. Here several rivers from continental Europe contribute to Black Sea ocean dynamics and pollution. While BSPC (Preamble) noted the input from third countries the insuf­ficiency to address this question legally, assessment by quantification and qualification may provide the facts for legal solutions. In a wider context, a comprehensive assessment could also lead to reconsider certain aspects of the legal term of pollution, or how to 'assess' them and qualify the impact. A rather strange example for illustration only. The term pollution includes "deleterious effects as harm to living resources and marine life". The plaque Mnemiopsis is a living resource and marine life. Thus an introduction of substance or energy by man can be detrimental to the jellyfish but could turn out to be a blessing for other marine life. More practical is a conceptual framework for assessment requirements in oil pollution by vessels and related incidents (hazard goods). As indicated above the shipping industry is suspicious of increasing non‑transparent compensation demands due to by ‘new science‘ assessment technique and 'fantasy' compensation claims. A test‑site investigation on qualification assessment may provide criteria for a more standardized solution. For example: while damage assessment (injuries to human, to beaches, installation, fisheries etc.) is strictly confined to damage to man, the 'impact on the sea' including living resources and marine life ( if not subject to direct economic loss) is cate­gorized according to volume of discharge, type of oil (or type of cargo), the sea area and made subject to a lump sum payment. The amount would be based on the potentiality of threat, adjusted according to knowledge and general binding in all jurisdictions. It is not only a subject of equality in international trade, but even more a subject of finding a reasonable relation to the other 90% sources which account for marine pollution. The present assessment praxis for vessel incidents has many flaws. As long as the ocean system is too little understood, 'scientific research assessment' and incident related 'damage assessment' should be strictly separated. The reasonable and international acceptability could be developed in a small ocean basin. The Black Sea is to see huge oil transports from the Caspian Sea region in the near future. Until now the principle approach on marine protection and preservation is largely confined to the condition of the legal term pollution. Whether other uses of the sea have an impact on the marine environment has attracted little interest. A test‑site on qualification assess­ment would have to identify and consider any possible source of ocean forcing or other impacts and to establish (evaluate) the facts as accurate as possible. For example, impacts that contribute to changes in the sea surface layer structure in regard to salinity, temperature or currents due to activities at and in the sea. The relative high stability of the basin's two water bodies provide circumstances for obtaining more clarity in this respect. The meaning and scope of precautionary is rather imprecise. The Rio Declaration 1992 requires in the most general terms a "precautionary approach" when a threat of serious or irreversible damage is pos­sible. Lack of full scientific certainty shall not be used as a reason for post­poning cost‑effective measures. As outlined previously, in legal documents the principle is used to assess proposed activities or impact of pollution. The Black Sea situation needs a much more sensible approach. Precaution is to observe between the natural impact (or threat) of the hydro­gen sulfide water body on the sea surface layer and vice versa the impact of man on the surface layer and subsequently on the deep water body. The cold intermediate layer (CIL) for example could possibly be a very useful object to improve the meaning of precaution and up to which extend the principle should be applied. In as nutshell, the principle is good but toothless. It can not bit as it is applicability in very limited range only. The extent is confined to knowledge and meant as reciprocate, impact on man. What the principle actually should have in view is its application from the point of the oceans, and defined as legal term reflecting the obligation of Article 192 UNCLOS. The suggested strategy on quantification and qualification assessment aims to change the wheel in that direction. Rivers and closed seas might be subject to rehabilitated by man, the sea areas off coastal ocean shores can not. Here, rehabilitation, if not by ‘self purification‘, is done by oceans currents taking polluted water somewhere else indefinitely or return it back one day in the future. Whether the Black Sea can be subject to rehabilitation is one thing, another question is that many useful and important criteria and solutions may emerge if seriously and comprehensively addressed. Using the word resetting may face opposition but there is hardly any better one to distinguish a situation which is not rehabilitation even if used not too narrowly. Meant is a substantial change of the marine environment which is different from the traditional status either by natural changes or 'deterioration' caused by man or, active intervention by man. One day the Black Sea may be considered for undertaking a "resetting". A substantial change would be of tremendous importance for the international community in many ways with considerable impact of defining assessment criteria and marine management policy. in a staggered form of 'potentiality', including relevant interchanges. The observational means by Model I would provide a solid baseline to address the relation man‑ocean comprehensively Further subjects are likely to turn out in high numbers. Some may be identified as urgent, or very significant, or only of general interests. The way to raise, to elaborate and to present them is to include in the model strategy. Thus the terms may emphasize the identification of fields of importance or urgencies. But the most important aspect of running a test‑site on assessment is transparency with regard to any step and any result presented. Only accessibility and clarity of presentation of all data and evaluating processes pave the way for transferring results into international binding laws. Management should know what they are talking about and base decisions on save facts. Politics sometimes seems not being fully aware of the dimension of the oceans and the complexity of task ahead. For that reason they have adopted legal concepts on the marine environment as they are used to in land territories. Protection and preservation of the marine environment requires identifying the scale of requirements resulting from the obligation. The question of state responsibility in practice is still an open matter. Nevertheless, any activity by man could be counterproductive to the state of the ocean system. But by today’s knowledge and means it is impossible to identify all sources which are or have the potential to force changes and to evaluate their immediate or long term impact on parts or the whole system. The legal responsibility of states exist and the lack of knowledge require steps to close the gap. The legal impact of responsibility and liability must be based on a transparent concept and equally applicable to everyone. Not every responsibility which can not be observed need to result in legal damage compensation, but may resorted to other measures either active or other regulatory means. The decision is a matter of socio‑political priorities and subsequently of laws and regulations. The legal concept should observe all aspects which have or may have an impact. The burden is to distribute among all contributors on a reasonable fair and equal basis. Although a global issue, the structure of responsibilities is based on sovereignty and international and national laws. The present approach to marine environment assessment and system of liability is a factor of insecurity among states and legal development due to differences in assessments procedures and interpretation of applicable legal definitions. Without a recognized level of equal and fair treatment among all polluters, trust in a legal concept for the protection of the marine environment is difficult to achieve. Comprehensive assessment is a prerequisite for the identification of responsibilities and the basis on which impact, preventive measures and compensation is to formulate. These subjects not only play a major role for the understanding of the oceans but for the unification of national and international laws on liability, compensation or other compensatory matters. Litigation is a sufficient means for effectiveness. But courts have to stick to the laws. They can only contribute in accordance with the legal framework available. The handling of assessment and compensation for inflic­ting the marine environment is still far away from exploring the potential of legal responsibility and liability. Negligence in this respect is not only disregard to the ocean issue but may also undermine the legal principle of justice and international legal developments. The Black Sea conditions provide an excellent field for more progress in developing the international law. Until now, the Stockholm Declaration from 1972 on State liability and compensation is an open matter. Defining marine environment impact procedures and drawing conclusions from the result is a precondition. But liability among states or persons is meanwhile only one side of the medal. A balance between mankind and ocean is an even more urgent subject. combination with the inclusion of objectives like environmental control, contin­gency planning, pollution prevention, law enforcement, claim management and legislation a number of concepts could be addressed and tested on their viability, usefulness and acceptance to the Black Sea region or elsewhere. Initiating and running a model case can be defined in any respect, e.g. excluding port areas or shallow waters. A test case implies in particular a time limit with the inclusion of reestablishing some or all concessions made on jurisdiction and sovereign rights after the agreed time period runs out. As the number of items worth to consider is almost unlimited the following discussion can only touch some aspects. Based on the Model I 'ocean observing' and Model II 'assessment ‑ compensation' the model ‘one ocean ‑ one system‘ could be based on a concept as given in Figure 4. The structure indicated can vary in many directions but aims at minimizing the need for creation of new institutions or organizations while arranged temporarily only, but attractive to Black Sea countries as well as for third countries or international organizations. However, this paper cannot and aims not for more than to raise interest in such considerations and thus may more ask questions rather than offering any concrete concept. The principle goal is the optimal organization and making use of the Model I & II. But their effectiveness could be strongly enhanced by (temporarily) including further tasks and initiate more ‘ocean mindedness‘. Ocean mindedness could be translated in: don't divide what belongs together. Some thousand years ago nature connected the Black Sea to the ocean system, extremely remote, but nevertheless significantly. Ever since the pure fresh water body ceased. Ever since a direct navigational strait with a water volume of roughly 3,500 km3 was established. One fifth is replaced annually, by surface water from the Black Sea and high saline deep water from the Mediterranean Sea ending in the northern basin. There it contributes to the anoxic water body, while the strait's water in the surface layer is brackish. The Straits and the basin belong to the same system. Straits water (pollution) ‑ Black Sea water (pollution). Comment concerning water from the Black Sea: The Marmara Sea receives via the natural exchange from the Black Sea, roughly 15 times more organic matter than that contained in the sewage discharged from Istanbul. Comment concerning sewage entering Black Sea deep water: Even if tertiary treatment systems are constructed at a cost of approximately 10 billion USD, to control the nutrient load originating in Istanbul, will there really be a significant improvement in terms of eutrophication and in terms of the ecological status of the Marmara Sea, despite the nutrient loads brought in by the Black Sea. It goes almost without saying, that the latter comment requires first the implementation of an action plan regarding the Danube before " the discharge of wastewater of Istanbul into the lower layer of the Bosphorus through a system of marine outfalls following primary treatment, seems to be an acceptable short term solution". The comments illustrate well the close connection of the ‘natural‘ water and the ‘polluted‘ water in both areas. At least, BSPC establishes a forum for more cooperation. But cooperation is a piece‑ meal political process by unanimity of decisions (Art.20,BSPC) and national jurisdiction execution (Art. 16,BSPC). In addition Black Sea's in and out going polluted water and in and outgoing international shipping are fully excluded from efforts under BSPC. Her only the means of diplomacy can seek solutions. The number of prerequisite political and administrative processing of efforts is hardly to work as sufficiently and speed as the situation requires. While the meaning of cooperation is very general in term, particular Black Sea issues may be useful to address more specifically. Instead of protecting statehood, "the emphasis must be on learning about the nature of the problem, the experience of other coastal states in attempting to control land‑based pollution" recommended a eminent legal expert recently. Unfortunately, there is little to learn or copy from. Instead, convincing efforts, arrangements and results in pursue of effective ocean management in a test‑site case could serve as example elsewhere. Historically and by international legal definition the Turkish Straits are internal waters and Turkey the sovereign. The Montreaux Convention provides international shipping with "freedom of transit and navigation" through the Straits (see Chapter I). From 35.000 ships passing the southern part (Canakkale Straits) and 50.000 ships the northern part (Istanbul Straits) about 75% is foreign tonnage. While they seek unhampered passage, no delays or any requirements beyond international standards and extra costs, the Turkish Government‘s concern is safety of navigation in environmentally sensitive waters. The opposing interests inevitably establish a situation of conflict and if not solved is likely to continue for a long time. It would hamper solutions in other field of Black Sea pollution. While there are many political and legal points to argue this paper is to put the subject in context with ocean manage­ment and the question what 'regime' should prevail, or in other words could a 'one ocean' approach be convincing and urgently enough to compromise on otherwise contrary positions. The Shipping issue ‑ Protection versus Economics. While ocean pollution concern started with regulating oil pollution from vessels in the 1950s the shipping industry is no longer the main concern. Shipping in general as vessel pollution is highly regulated and controlled but also the most comprehensively covered pollution source by an international legal framework for damage compensation and insurance. During this four decades, the concern of the industry was the assurance of equality on rights, obligation and enforcement. The underlying question was always fair economic conditions in international trade and access to the trade. It includes equal treatment in all cases of pollution regardless of jurisdiction. Even damage assessment can not be excluded as "it is a subject that not only plays a major role for the unification of civil liability but which at the same time puts unification at risk due to the gaps in present damage definition of unified law and the influence of national environmental policy and national legal views and jurisprudence". The Black Sea regional economy is particularly sensitive on shipping matters. Thus the Montreaux Convention is something the shipping industry and the states reliant on shipping are reluctant to see effected. In addition from the total of vessel source pollution ship accidents account only for a percentage of 20% while habor operations account for more than 50%. And as far as accidents are the concern quick and proper response accounts often more than anything else in minimizing the effect of an incident. Ships in transit through the Straits and in the Black Sea is a minimal threat to the regional marine environment compared to other sources. Proportions should matter. Far more severe is land‑based pollution with 90%. Regional organization of "Port State Control". It is the responsibility of the state (flag state) who granted a vessel the right to fly its flag, to identify instances of a vessels not compliance with international standards. While deemed not sufficient enough coastal states were given a number of rights including inspection for identifying substandard ships. Port State Control is a method of checking on the flag state’s success in enforcing the provisions of the international conventions covering safety and pollution prevention standards on merchant ships. Comparative agreements have been implemented, although not for the Black Sea. Meanwhile the European Community requires more stringent checks. Regional effective­ness could be enhanced by a co‑ordinated geographical coverage organized by and with participation of all riparian countries. To protect the regional seas from substandard ships in international trade, a survey or initial survey the most appropriate time and place is before the vessel enters the Black Sea or before a ship bound for the Straits leaves a Black Sea port. 1. A committed approach on Model I (observation) would require ship capacity, which could be partly or wholly included to the subject matter or form a core unit/coordinating role. preparedness is expensive and a matter of assigned responsibility and liability (insurance) together with redress in case of 'insufficiency'. contribute to one emergency system only. Navigation Management‑Pilotage, Tug‑assistance, Reporting‑system etc. Navigation from and to the Black Sea can often take as much time as proceeding to the Black Sea port of call. From the point of marine environment protection, any and all precautionary means established, have to be observed, executed and controlled anywhere throughout the region based on the same set of rules, standards and procedures, as well as subsequent costs, expenses and compensation. The navigation management is a concern of all riparian countries based on equal involvement, contribution and redress. One Ocean ‑ One Shipping Jurisdiction. At least in regard to vessel pollution and preventive measures the set of civil, administrative and criminal laws require to be applicable and enforced in a uniform manner by one jurisdiction. If that is guaranteed, neither the regional based shipping industry is likely to complain nor is the navigation issue continue to remain a subject of concern. Conducting a test‑site is assumed to be an international undertaking. With Third Party monetary contribution and/or participation the agreed conditions for conducting the undertaking could either subject to a separate International Agreement (Art. 5(4) BSPC) or subject to an Annex to the BSPC (Art. 20‑22). Any issue included in regard to the Turkish Straits would need an international agreement. could be the "Meeting of Contracting Parties" plus non‑ Black Sea States if so agreed (Article 19 BSPC). It would supervise the undertaking and consider and approve Amendments and Annexes to BSPC. The Black Sea Commission (Article 17 BSPC) would either function as subordinate body to the Board (Article 18 BSPC) or given a designated role in a ‘test‑site‘ programme with certain obligations and responsibilities. but also to act as plaintiff on behalf of the Board or as "custodian" of the waters in the Black Sea and Turkish Straits. The funds of the Trust are to be used for damage compensation (to countries and individuals) and for ocean management. According to Article 16 BSPC (Responsibility and liability) there is little room to discuss this matter, as it is up to every State Party to BSPC to implement rules on liability for damage and recourse, while obliged to cooperate in developing and harmonizing their laws. One of the best means, unified, transparent, equal judgments by experienced courts to serve the Black Sea issue is largely ignored. It is a field where common juridical systems are of little help. The Black Sea problems seem sufficiently only addressed with a ‘Black Sea court‘ (system) to ensure not only progress in regard to the protection of the sea itself but simultaneously fair competition, compensation standards, as well a equality in rights and obligations including as core issue the comprehensive protection of the Black Sea itself. At least the opportunity given by the UNCLOS Dispute Settlement System with access to International Tribunals, if so stipulated in an agreement, is a option worth to consider. There are a number of institutions which could be assigned (e.g. regional sea commissions) or asked to accept temporarily management functions e.g. the International Sea‑bed Authority/Jamaica, UNEP/Nairobi, IMO/London, IOC/Paris or a established EU Institution or Programme. The assignment or participation in Model I , Model II and other tasks could be under sole or joint responsibilities. The extent and conditions depend on the willingness of man‑power input, contribution and prosepective results. The International Sea‑bed Authority which has no jurisdiction over parts of the deep sea floor in the Black Sea due to the narrowness of the basin could act only with the approval of the Assembly of the Authority (Article 160 UNCLOS). But to conduct deep‑sea mining on day the Authority need to have experience. For UNEP or other international organizations a ‘show‑case‘ in coastal sea management seems no less attractive. The involvement of these institutions in one or the other way would not only avoid creating new entities but assure a wide international interest in a test‑site programme and its results. After all, BSPC (Article 5(5)) states that the Contracting Parties will cooperate in promoting, within international organizations found to be competent to them, the elaboration of measures contributing to the protection and preservation of the marine environment of the Black Sea. They noted the pollution input emanating from third countries in Europe and corresponding deficiencies in existing international agreements to cover some aspects in this respect (Preamble, BSPC). States are obliged to protect and preserve the marine environment. All acts or omissions inconsistent with this responsibility imply violation. Wrongdoing implies reparation. So say the principles of international laws. In practice the effect is not existent. The principle stands without legislation. 90% of marine pollution is not scrutinized for its potential as a violation. The mechanism of law to act before being held liable is ignored, while the state of coastal waters and the oceans drift to an unknown status. The insufficient use of law has many reasons. The core of the matter is lack of reliable facts. In a nutshell, the oceans are too little understood, even less the impact of activities by man on the sea and the system. It will not be understood for long. The ocean system is too big and a complex matter as well. It may take many decades to realize what actions could and should have been taken much earlier, to avoid irreversible ocean changes through anthropogenic influencing. Influencing can change ocean dynamics, physics, or chemical structure and subsequently the climate. Influencing can effect the marine biota and marine sediments. A smaller system with oceanic conditions could shorten the time period to gather experience and principles for legal developments. The Black Sea offers the proper dimension and conditions for being used to concentrate on two urgent task under test‑site conditions. The ocean system must become one day 'transparent' by a computed 'true ocean image'. The image must be available frequently and detailed enough to detect antrophogenic causing and to forecast the impact far ahead. For this purpose one has to know the relation between the number of observed true data and the capability of computer science to provide a true image and to forecast the future state of the oceans. As it is also necessary to identify and evaluate any antrophogenic impact on ocean dynamics, the development of a test‑site ocean image could be used to form a baseline for legal developments. To define applicable responsibilities anthropogenic impacts on ocean dynamics, marine biota and marine sediments the test‑site categorizes the potential of threat and considers other legal concepts and stipulation relevant to protect and preserve the seas. A closed sea with a narrow connection to the ocean system provides all principle ingredients for running experimental models on task to done, but impossible to achieve in the oceans themselves for a long time. It would also minimize the risk of misinvestment. The Black Sea is a 'miniature ocean' with severe ecological problems. The Black Sea region has economic problems. Black Sea navigation faces political problems. All problems have in one or the other way to do with the marine environment. Black Sea countries could prove that the concern for the marine environment is superior to statehood and national jurisdiction, recognizing that the ocean system can not be divided, that marine pollution in the sea cannot be divided and that international shipping should not be divided. The Black Sea as test‑site would be a beneficiary for the riparian countries and the community of states. Without more stringent progress in ocean matters the industrialized world may not know for long, how to establish a "productive life in harmony withnature". Murray, J.W., in: Izdar, E., & J.W. Murray (eds. ), Black Sea Oceanography; Hydrographic Variability in the Black Sea, Dordrecht 1991, PP. 1‑15. Ye, M.,Monitoring of the Open Region of the Black Sea, Oceanology Vol.33, 1993, PP.271‑274; particularly the Azov Sea, Odessa Bay and Burgass Bay. International Herald Tribune, 25 November 1991, "Ecologicial Harm Makes Black Sea Bleak", by M.Simons. Cf. Footnote 6 (below) ; Earth Summit in Rio de Janeiro 1992. Özsoy, E., T.Zafer, G. White & J.W. Murray; in: Izdar, E., J.W. Murray (eds.) Black Sea Oceanography, Double Diffuse Intrusions, Mixing and Deep Sea Convection Processes in the Black Sea, Dordrecht 1991, PP. 17‑42. Cf. : Stanev, E.V., V.M. Roussenov, N.H. Rachev & J.V. Steneva, Sea response to atmospheric variability model study for the Black Sea, Journal of Marine System, Vol.6, 1995, PP. 241‑267 (243). The United Nations Conference on Environment and Development (3‑14 June 1992) (UNCED) with the: Rio Declaration on Environment and Development; and: Agenda 21; Document: UN/A/Conf.151/26 (Vol.I‑III). Rio Declaration 1992, ibid, Principle 3. Agenda 21, ibid, Chapter 17.1; (Introduction to Chapter 17 on Protection of the Seas). Rio Declaration 1992, ibid, Principle 13. Agenda 21, ibid, Chapter 17, Section 17.6(d) and Section 17.100‑17.114. Chapter 17 of Agenda 21, ibid, comprises subchapter A‑G, with 135 paragraphs. International Herald Tribune, 22, 23, 24 & 25 June 1997. Bernaerts, A., in: Mensah, Thomas A., Ocean Governance: Strategies and Approaches for the 21st Century / Proccedings of The Law of the Sea Institute ‑ 28th Conference 1994; Legal Means for Understanding the Marine and Climatic Change Issue; Honolulu 1996. PP.156‑180. IOC, The Case for GOOS, IOC/INF‑915 Corr., Paris, 23. February 1993, P. A10. UNEP, Tolba & El‑Kholy(Eds. ), The World Environment 1972‑1992, Two Decades of Challenge; London 1992, P.604. Agenda 21, op.cit., Chapter 17.101‑2. IOC, The Case For GOOS, Doc. : IOC/INF‑915 Corr., Paris, 23. February 1993. Kiss, A., in: Francioni,F. & T. Scovazzi (Eds. ), International Responsibility for Environmental Harm; Present Limits to the Enforcment of State Responsibility for Envirnmental Damage, London 1991/1993 (Reprint), PP.3‑14. Marine Pollution Conventions on enclosed or semi‑enclosed seas: Mediterranean Sea (Barcelona 1975), Arabian/Persian Gulf (Kuwait 1978), Wider Caribbean (1981), Red Sea & Gulf of Aden (1982), Baltic Sea (Helsinki 1974), North Sea (Bonn 1969). The texts of BSPC and Protocols in: New Directions in the Law of the Sea (Eds. Lee & Hayashi), 1995, No. V.11. Art. 197 UNCLOS; "States shall co‑operate....on a regional basis, directly or through competent international organizations, .... taking into account characteristic regional features." Reprint in: New Directions in the Law of the Sea (Eds. Lee & Hayashi), 1995, No. VII.5‑1. Novoselov, A.A., in: Eremeev, V.N. (Ed.i.Chief), Complex Oceanographic Research of the Black Sea; The problem of determination of oxic/anoxic interface in the Black Sea, Utrecht 1992, PP.98‑101. Oguz,T., A.M.Latif, H.I.Sur, E.Ozsoy & U.Unluata; in: Izdar,E. & J.W.Murray(eds), Black Sea Oceanography; On the Dynamics of the Southern Black Sea, Dordrecht 1991, PP.43‑63 (43). E.g., The 1988 Black Sea Expedition (USA & Turkey) ; HYDROBLACK ‘91; CoMSBLACK '92a. E.g., NATO‑Advanced Research Workshop, Cesme.Izmir, Turkey, October 1987; the Bulgarian‑Soviet siminar "Pomoriye‑88"; Workshop for the Black Sea, Varna, Burlaria, September 1991; Int. Conference "Problems of the Black Sea", Sevastopol, Ukraine, November 1992; Workshop for the Black Sea, Varna, Bulgaria, September 1994; Black Sea Regional Conference, Varna 1995. Intergovernmental Meeting on the IOC Black Sea Regional Programme in Marine Sciences and Services, Paris, France, 7‑9 June 1995, Doc. : IOC/IGM‑BS/3; IOC‑Series No.68. International Herald Tribune, 17‑18. May 1997, "Caspian to Black Sea:$2 Billion Pipeline Set". Through the Turkis Straits formed by the Dardadelles (62 km, minimum width 1.2 km, depth average 55 m max. 105 m), Marmara Sea (190 km, depth max. 1.335m, area 11.500 km2, volume 3.378 km3) and Bosporous (31 km, minimum width 0.7 km, average depth 35 m, max. 110 m). Total length (Gelibolu‑Izmit) 276 km. The navigation distance is given with 160 nautical miles (296km). For details see: Plant,G., Navigation regime in the Turkish Straits for merchant ships in peacetime, Marine Policy, 1996, PP. 15‑27; Scovazzi,T., Management regimes and responisbility for international straits, Marine Policy, 1995, PP. 137‑152. UNCLOS Part III, Art. 34‑36. Art. 35 (sentence c) states: Nothing in this Part affects the legal régime in straits in which passage is regulated in whole or in part by long‑standing international conventions in force speciffically related to such straits. Reprint in: New Directions in the Law of the Sea (Eds. Lee & Hyashi), 1996, No.V.3.b(1). Art.1, BSPC. UNCLOS defines the TS = 12 nautical miles, EEZ = 200 nautical miles, each measured from the Baseline (= coastline). Art. 8, 9 & 10, BSPC. In comparition, by 'closing' the Baltic Sea the sea‑level would rise 124cm/year; but sinking in the Mediterranean by 96 cm/year. At the seafloor geothermal heat flow from sediments (to the immidiate water 30‑80m above) may have an impact on circulation; Özsoy, Top et al. op.cit. ; Cf. Kushnir, V.M., Thermal fluxes and stability of the upper boundary of deep near‑bottom layer in the Black Sea, Phys.Oceanogr.,Vol.8,N.1, 1997, PP.29‑38. Murray, J.W., Z.Top, & E. Özsoy, Hydrographic properties and ventilation of the Black Sea, Deep Sea Research, Vol.38, Suppl. 2, 1991, PP. S663‑S689. Müller, G., Das Schwarze Meer, Geowissenschaften Vol. 13, 1995, PP. 202‑206. The formation of the cold intermediate layer (CIL) is defined by the strong salinity input to the Black Sea stratification and heating of the deep‑water mass by warm Mediterranean water. A strong halocline ( a layer of sea water with which a marked salinity gradient is present, furnishing significant clues to the origin and and movement of watermasses) restricts the depth of winter convection. Murray, J.W., Z.Top & E. Özsoy, Hydrographic properties and ventilation of the Black Sea, Deep‑Sea Research, Vol. 38, Suppl. 2, 1991, PP. S663‑S689. Bulgakov, N.P., YU.N. Golubev & A.YU. Kuftarkov, Response of the vertical profiles of oxygen and hydrogen sulphide to variation of the components of the water balance in the Black Sea, Sov. J. Phy. Oceanogr., Vol. 2, No.1, 1991, PP.71‑77. According to Bezborodov, A.A., in: Eremeev, V.N. (ed. ), Complex Oceanographic research of the Black Sea; The fine geochemical structure of the oxis/anoxis interface layer in the Black Sea, Utrecht, 1992, PP.103‑109): "Between the 20 and 50 m depth, oxygen concentration drastically decrease from 6.0‑6.4 to 0.3‑0.5 mll(Milli‑liter) with gradients of 0.1‑0.3 mll. In the 20‑30 m layer above the H2S zone, the vertical O2 distribution curve bends sharply, and the oxygen concentration reduces more slowly , with the gradient being mll/m at most. Oxygen concentration in the 20‑30 m layer overlying the boundary of the H2S zone does not normally exceed 0.2 mll." Latun, V.S., in: Eremeev, V.N.(ed.) Complex Oceanographic Research of the Black Sea; About the motions of the deep layer in the Black Sea, 1992, PP. 1‑6. Major axis length = 1150 km; North‑South = about 650 km; area = 423.000 square km; volume 534.000 cubic km. According to Latun, op.cit. : "The Main Black Sea current is distinctly cyclonic". Stations indicated current velocities of 2.5 cm/s‑1 (500‑1000m), and 11‑20 cm/s‑1 (1500m depth). Bulgakov, S.N., S.G.Demyshev & G.K.Korotaev; in: IOC/ CoMSBLACK, Problems of the Black Sea, Int. Conf. Sevastopol 1992; Modelling of the Black Sea circulation and water stratification, 1992, PP. 34‑53. Bulgakov et al. op.cit. ; cf., Ünlüata, Aubrey, Belberov, et al., International Program Investigating the Black Sea, EOS, Vol. 74, N.36, 1993, PP. 401,407 & 412. The Black Sea suface temperature varies from 7‑8°C in winter to 22‑26°C in summer. Baltic surface temperature varies from 0‑3°C in winter and to 13‑18°C in summer; at depth of 80m and below the temperature is 2‑6°C. The water salinity in the Northern Baltic (fresh‑water) and Southern Baltic (Kiel Bight > 15‰) is very different. In the central part 6‑7 ‰ at the surface and 10‑13‰ at the sea bottom. The Baltic has periodically anoxic water at the sea floor in the range 0‑20% of the total water volume. In the Southern Baltic this water is partly ventilated by rare ‘crash‘ inflow of high saline water from the North Sea. Murray,J.W., in: Izdar, E., & J.W. Murray, Black Sea Oceanography, Hydrographic variability in the Black Sea, Dordrecht, 1991, PP. 1‑15. Total drainage area 2,4 Mio. square km; cf., Leppäkoski & Mishnea, op.cit..
 Stanev, E.V., V.M.Roussenov, N.H.Rachev & J.V.Staneva; Sea response to atmospheric variability.Model study for the Black Sea, Journal of Marine Systems, Vol.6,1995,PP.241‑267. Drozdov,V.A.,O.B.Glezer,T.G.Nefedova & I.V.Shabdurasulov, Ecologicial and geographicial charateristics of the coastal zone of the Black Sea, GeoJournal, Vol.27,1992, PP:169‑178. Volovik, S.P., V.G.Dubinina & A.D. Semenov, in: FAO, Fisheries and environment studies in the Black Sea System, Hydrobiology and dynamics of fishing in the Sea of Azov, No.64, 1993, PP. 1‑58. For comparition with the fishery in the Turkish Straits (area onethird the size of Azov Sea, or, ratio 1:45 Black Sea), cf.,: Kocatas, A.,T.Koray,M.Kaya & O.F.Kara, in: FOA (Ibid. ), Review of the Fishery rescources and their environment in the Sea of Marmara, PP: 87‑143, with a yield in the early 1980s of about 60.000 tons/p.a. and in 1988 > 70.000 tons. Volovik et al., Ibid. According to their reference in Footnote 66, the Ctenophora Mnemiopsis leidyi arrived in the Black Sea from the north‑western Atlantik with ship ballast water in 1983‑84. Zaitsev, Yu.P., in: FAO, Fisheries and Environment Studies in the Black Sea System; Impact of Eutrophication on the Black Sea Fauna, No.64, 1993, PP. 59‑86, with further details. Cf., Kocatas et al., op.cit., on the share of Turkish fishery with more than 400.000 tons (1983‑87) and about 530.000 tons in 1988. According to Leppäkoski et al., op.cit. Black Sea catch was 86.000 t in 1939 and increased to > 900.000t in the mid‑1980s. OECD, Bulgaria‑Environmental Performance Review, Paris 1996, P.133. In the 1950s there were almost one million dolphins in the Black Sea with an estimated consumption of 500,000 tons fish annually. In the early 1980s the number had dropped to less than 100,000; cf., Kocatas et al., op.cit. ; cf., Leppakoski & Mihnea., op.cit..
 Volovik et.al., op.cit.,. "With the low salinity of the sea, any increased river inflow involves greater reproduction....;while with increased salinity, this relation is sharply disturbed." Cf. Murray, Top & Özsoy, in: Deep Sea Research 1991, op.cit., PP. S672‑S676. Dotsenko, S.F., Radiation of long waves from Black Sea seismic zones, Phys. Oceanogr., Vol.7,No.5, 1996, PP: 315‑320. The most recent tusinamis : 26 June & 12 September 1927, 26 December 1939, and 12 July 1966. The historical events: 20(C.E. ), 101 (C.E. ), 543 (C.E.) & 1427 (C.E.). Dotsenko S.F., & A.V. Konovalov, Tsunami waves in the Black Sea in 1927: Observations and numerical modelling, Phys.Oceanogr., Vol. 7, No.6, 1996, PP. 389‑401. Cf., Ranguelov, B. & D. Gospodinov, in: Sekoulov,I., R.Arsov et.al. (Eds), Environment Protection Technologies for Coastal Areas (Black Sea Regional Conference 1995), Tsumani Vulnerability Modeling for the Bulgarian Black Sea Coast, Sofia 1995, PP.105‑111. Leppäkoski & Mihnea, op.cit. : "There are thousands of papers dealing with man‘s input on the health of seas, but few which focus on the opposite, e.g., the overall effect of eutrophications and pollution on the services and amenities that a sea area provides to humans, i.e., the well‑being and economic welfare of man." Ünlüata, Aubrey & et.al., op.cit..
 Convention for the Protection of the Marine Environment of the North‑East Atlantic 1992. The Convention replaces the Prevention of Marine Pollution by Dumping from Ships and Aircraft, 1972 (Oslo Convention) and the Convention for the Prevention of Marine Pollution from Land‑Based Source, 1974 (Paris Convention). Convention on the Protection of the Marine Environment of the Baltic Sea Area, 1992, which will replace, upon entry into force, the 'Helsinki Convention' of 22. March 1974. Art. 3 & 24, BSPC. Art. 17, 18 & 23, BSPC. Definition on marine pollution Art.1, para. 1, BSPC is identical with Art. 1 UNCLOS. According to Art. 1, para. 4, BSPC, Harmful substances means "any hazardous, noxious or other substances, the introduction of which into the marine environment would result in pollution or adverserly affect the bio processes due to its toxicity and/or persistence and/or bioaccumulation characteristics". op.cit. ( section: Black Sea Conference in Chapter One). Art.2, para. 2(b), NEAPC :"the polluter pay principle, by virtue of which the costs of pollution prevention, control and reduction measures are to be borne by the polluter". The Baltic Sea Conv. Art.3, para. 4, states: "The Contracting Parties shall apply the polluter‑pays principle". Art. 16, para. 2, BSPC, (responsibility and liability). Art. 15, para. 3, BSPC. Art. 15, para. 1, BSPC. Art. 8, NEAPC. Art. 15, para. 2, BSPC. Art.6, NEAPC. Art. 19 & Art. 17, BSPC. Art. 28, para. 2 & Art. 19, para.3, BSPC; cf., Art. 17, para. 5, BSPC. Art. 5, para. 5, BSPC. Agenda 21, op.cit., Item 17.96. Agenda 21, op.cit., Item: 17.102 para.2. Report of the IOC Blue Ribbon Panel for a Global Ocean Observing System (GOOS), The Case For GOOS, IOC (INF‑915), Paris, 1993. Megascience:The OECD Forum, Oceanography, OECD Paris, 1994. Woods, J.D., Dahlin,H., et al., The Strategy for EuroGOOS; EuroGOOS Publ. No.1, Southampton 1996. IOC, The Approach to GOOS ‑ Action Paper, Doc. : IOC‑XVII/8 Annex 2, Paris, 27 January 1993. Cf., IPCC, Climate Change 1995‑Summary for Policymakers, 1996, PP. 37‑41. IOC, Workshop Report No.86, edited by Aubrey,D.G., Chairman of CoMSBlack. The main topics are: (1) studying long term and climate changes; (2) carring out the eddy‑resolving general circulation studies encompassing regional processes such as water mass formation, and (3) circulation dynamics of the coastel seas and their interactions with the open sea,......topography. The material has been received by personal communication with reference to "IOC 1996 Varna Workshop". Cf., Megascience:The OECD Forum, Oceanography, OECD Paris, 1994, P.79, with further details, indicating total costs US$ 1 Billion, excluding cost of satellites. Cf., Grishin, G.A., Makeev, I.G. & Mothyzhev; Remote observations of the water circulation in the western Black Sea; Sov.J.Phys.Oceanography, 1991, PP. 145‑155. Wood,J., The Global Ocean Observing System, Marine Policy, 1994, PP.445‑452. For details see: Megascience:The OECD Forum, Oceanography; Flemming, N.C., Analytical Report, OECD Paris, 1994, P. 106‑107. IOC, The Case for GOOS, IOC/INF‑915 Corr., Paris 23.Feb.1993, PP.14‑19. Stel, J.H. and Mannix, B.F., A benefit‑cost analysis of a regional Global Ocean Observing System: Seawatch Europe, Marine Policy, Vol.20, 1996, PP. 357‑376. 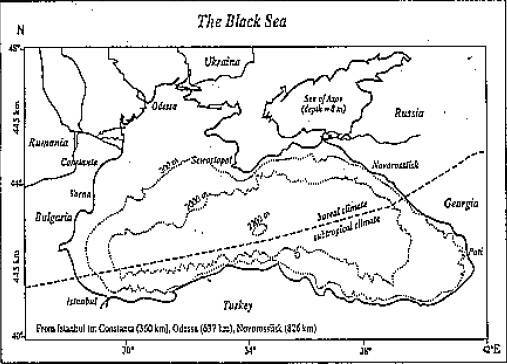 According to Dotsenko, S.F., The Black Sea tsunamis, in: Atmospheric and Oceanic Physics, Vol.30, 1995, P.483. Cf., (above), The water basin & A basin in comparision, in: Chapter Two. Op.cit., Principle 13 & 17. "Responsibility" is here used in a wide sence. In law the term "responsibility" usually means the consequences arising from the breach of obligations (see next Footnote) and subsequent liability(redress). A obligation termed as widely as in Art.192 UNCLOS, is imposing general responsibilities rather than immidiately binding legal duties. Cf., Art.304 UNCLOS: "The provisions of this convention regarding responsibility and liability for damage are without prejudice to the application of existing rules and the development of further rules regarding responsibility and liability und international law". In law the term is "liability", the duty to compensate damage according to legal responsibilities. Declaration of Principles on the Human Environment, in: UNEP Report of the United Nations Stockholm Conference on the Human Environment, UN Doc. A/CONF. 48/14, Nairobi, 1972. Art. 16, para.2, BSPC (Resposibility and liability). Cf., UN Global Programme of Action for the Protection of the Marine Environment from Land‑based Activities, 3. November 1995. Reprint in: New Directions in the Law of the Sea (Lee & Hayashi, Eds. ), 1996, No.11.B(4)‑1. Reprint in: International Environmental Law, No. 991:15. Cited in principle after: De Mello, Margarinos, The Law of Environmental Impact Assessment (Uruguay), Environmental Policy and Law,1995, PP.73‑75. Art. 200 UNCLOS (Studies, research programmes and exchange of information and data); Art. 204 UNCLOS (Monitoring of the risks or effects of pollution); Art. 206 UNCLOS (Assessment of potential effects of activities). In regard to deep sea mining Art. 165 UNCLOS requires the Legal and Technical Commission to "prepare assessments of the environmental implications of activities in the Area". The non‑binding Montreal Guidelines for the Protection of the Marine Environment against Pollution from Land‑based Sources, 1985, advises States to assess "potential effects/ impacts" which may cause marine pollution from land‑based sources; Cf., Meng Qing‑Nan, Land‑based Marine Pollution, London, 1987, P.174. GESAMP, Report for the second Session of the GESAMP Working Group on the Methodlogies and Guidelines for the Assessment of the Impact of Pollution on the Marine Environment, GESAMP XV/6, 10 December 1984; Paragraph 5.1.3..
 Art.1, para 1, subparagraph 4, UNCLOS; Art. 1, para. 2, BSPC. Odessa Declaration, op.cit. (see: Black Sea Conference, Chapter One), Item 12‑14. Art.8, Baltic Sea Convention 1992. Art. 3, para. 5, Baltic Sea Convention 1992. Annex III to the Convention is concerned with: Criteria and measures concerning the prevention of pollution from land‑based scources. Art. 2, para. 3(i), NEAPC with reference to Appendix 1 on Criteria for the Definition of Practice and Techniques; concerning: Best available technique. Cf., Clark, R.B., Marine Pollution, Oxford 1989(sec.Ed. ), PP.189‑212. For reference and details see: IOC, 29th Session of the Executive Council, 25.09.‑ 02.10.1996 in Paris, IOC/EC‑XXIX/3, Paris 07.Oct.1996, P.37. Ibid., Excerpt: "Scientific assessment would not discuss the political situation, jurisdiction, the legal regime, demographic changes and societal pressure, such considerations will, of course, dictate many, if not all, of the problems to be addressed. The assessment would evaluate the ocean knowledge that we have, or need to have, to solve present and future problems, including the capacity of countries, at all levels, to deal with these problems"
 Brealy, Mark (ed. ); Environmental Liabilities and Regulation in Europe, The Hague, 1993. Wang Mao Shen et al., in: De La Rue, C.M., Liability for Damage to the Marine Environment; The Normal Procedure of Assessment of Damage to the Marine Environment in Chinese Juridicial Practice, London 1993, PP.29‑31. IMO, Contingency Planning, Section II, Manual on Oil Pollution, London, 1995 Edition; Chapter 3.8. In force since 05. Feb.1996. The text used here is the Proposel of August 3, 1995, Doc. 15 CFR Part 990, published in the Federal Register /Vol. 60, No.149/ PP. 3804 ‑39834. The rules are based on the Comprehensive Environmental Response Compensation and Liability Act of 1980. Art. 15, para. 2, BSPC. Art. 4, para. 2 and Annex III, of NEAPC, regarding Offshore Scourses. Regulation 2, of Annex IV, Baltic Sea Convention 1992 on Prevention of pollution from ships. International Convention on Civil Liability for Oil Pollution Damage of 1992, IMO, London, 1996. Art. 1, para. 6, CLC. Adopted at the 35th Int. Conference of CMI, Sydney 2‑8 October 1994, Doc. Pollution/Sydney‑9. They are not binding but seem to be used by the International Oil Pollution Fund. Convetion on Civil Liability for Damage Resulting from Activities Dangerous to the Environment, Lugano 21.06.1993; (status 1996: not in force). Ibid. : according to the definition of damage : "compensation for impairment of the environment shall be limited to the costs of measures of reinstatement actually undertaken or to be undertaken". With few exception, e.g. oil film removal. 'Reinstatement' of ocean water is not possible. Global Programme of Action for the Protection of the Marine Environment from Land‑based Activities, 3 November 1995; reprint: New Directions in the Law of the Sea: Global Developments (Lee & Hayashi, Eds. ), New York 1996, No.11.B(4). Cf., Francioni, F., in: Lang,W., H.Neuhold & K.Zemanek (Eds. ), Environmental Protection and International Law; International co‑operation for the Protection of the Environment:The Procedural Dimension, London,1991/1995(2nd.Ed. ), PP. 203‑225. UNCLOS implicit grants sovereign rights within the limits of the Territorial Sea (Article 2) and in regard to the Exclusive Economic Zone (Article 56) sovereign rights in so far as exploration and exploiting the sea including 'such as the production of engery from water, currents and winds' is concerned. 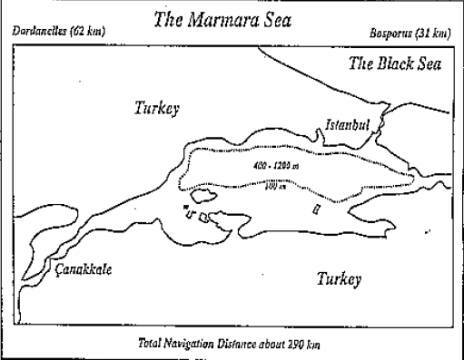 The volume of the Sea of Marmara accounts for 3.378 km3. Miles,E.L., in: Kusuma‑Atmadja, Mensah & Oxman (Eds. ), Sustainable Development and Preservation of the Oceans:The Challenges of UNCLOS and Agenda 21; The Approaches of UNCLOS III & Agenda 21 ‑ A Synthesis; Proceed. 29th Conf., Law of the Sea Institute., Honolulu 1997, PP.16‑42. Since the 17th century the legal view on maritime jurisdiction claims required the means of "effective power" sufficient enough to defend the claim (e.g. the range of cannons for establishing a territorial sea). Only later the governing principle "freedom of the sea" emerged. In 1927 the Permanent Court of Justice held, that the principle means: "the absence of any territorial sovereignity upon the high sea"; (PCIJ, Ser.A, No.10, Steamship "LOTUS"). Beyerlin,U. & T.Marauhn, Law‑Making and Law‑Enforcement in International Environmental Law after the 1992 Rio Conference, Berlin 1997, P.73. Orhon, D., in Sekoulov, I., R.Arsov, et.al. (Eds. ), Environment Protection Technologies for Coastal Areas (Black Sea Regional Conference on); Evaluation of the Black Sea Impact on the Marmara Sea Pollution, Sofia 1995, P. 401(407). Muftuoglu, Gonenc,I. et.al; in Sekoulov, I., Arsov,R., et.al. (Eds), ibid; Black Sea Factors Influencing Wastewater Disposal Strategy for Istanbul, Sofia 1995, P. 153(167). Global oil pollution from ships has decreased by 60% since 1981 from 1,47 million tons to 0,59 million tons in 1990 (cf., IMO News, No.1, 1997). International Maritime Organisation (IMO) conventions number to more than 50. Trotz, N.,in: de la Rue, C.M. (Ed. ), Liability for Damage to the Marine Environment; Colloquium on Assessment of Environmental Damage:Summary and Discussion; London 1993, PP.261‑264. Harbour Operations: 3867; Accidents: Collisions(388), Groundings(426), Hull failures(527), Fire & Explosions(147); Other incidents: 2058; (cf., IMO News, No.1, 1997). Article 218‑220 and 223‑233 UNCLOS. First stipulated in the Paris Memorandum of Understanding on Port State Control (1978) as regional agreement of 14 Western European countries, and Poland, Canada and the Russian Federation. Latin‑American Agreement(1992),States 10; Asia‑Pacific Memorandum(1993),States17; Caribbean Memorandum(1996), States 9; (cf. IMO News, No.2, 1996). EC Council Directive, Doc. 95/21/EC, 19.06.95; and (proposed) ammendments Doc. 96/C367/01, 02.10.1996. Cf.,OECD,Maritime Transport 1995, Paris 1997, P.140. In force since 1995, status 28 ratification ( 1996). E.g the Barcelona Convention provides generally that State Parties must cooperate in dealing with pollution emergencies. Brubaker, D., Marine Pollution and International Law, London, 1993, P.183‑189. Selecting the means of a legal instrument would require a number of elaborations ( e.g. Art. 3 & 24 BSPC) which are not discussed in this paper even if indicated. Article, 288 para. 2, UNCLOS; cf. 291 para. 2, UNCLOS.